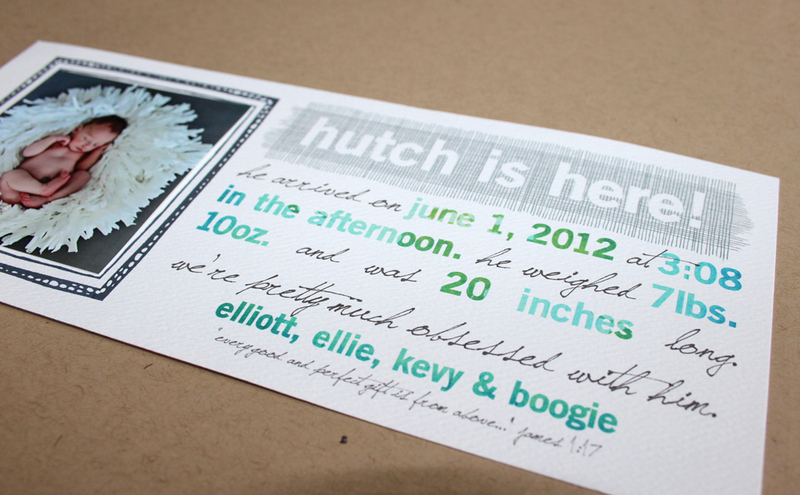 Here’s an invitation I put together for a rehearsal dinner. She’s got Italian roots. He’s grew up in England. 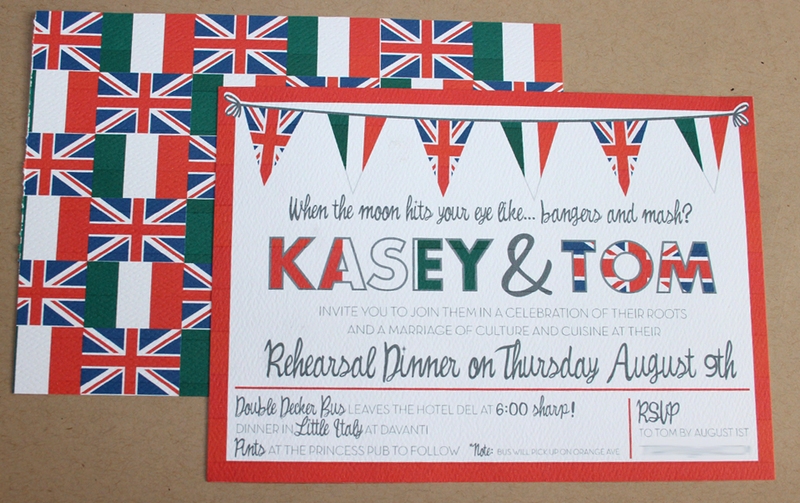 They were planning on taking a double decker bus to an Italian restaurant for the rehearsal dinner. It was a fun one to work on. 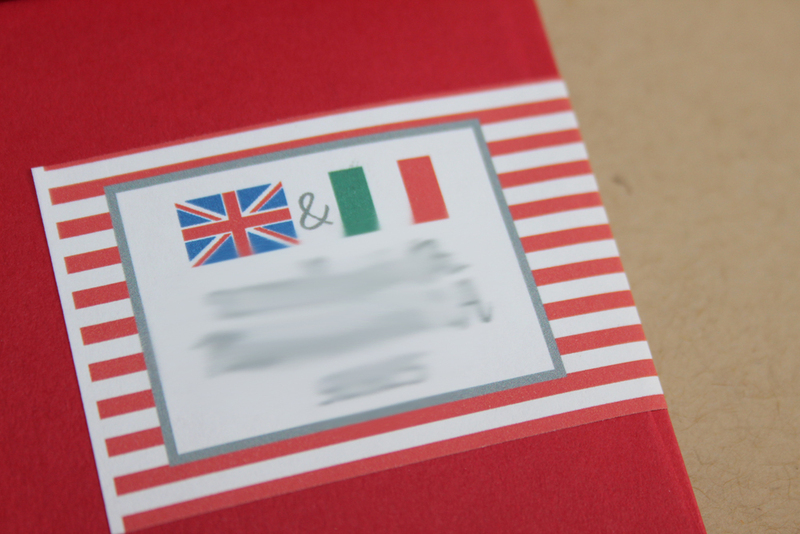 The back of the invite was covered in Italian flags and Union Jacks. Fun. I can’t believe I forgot to post this and I can’t believe that these are the only horrible photos I have, but hopefully you can visualize how cute this really was. Anyway, back at the end of May, I turned 33. I truly wanted to do absolutely nothing for it. I scheduled a baby appointment that day and my mom watched the boys. When I got home, I was surprised with a huge floating banner made out of thick wrapping paper and floating gold seals all over my dining room. Isn’t that a fun way to walk into a room? I loved it so much I kept it up until everything started to fall on it’s own. 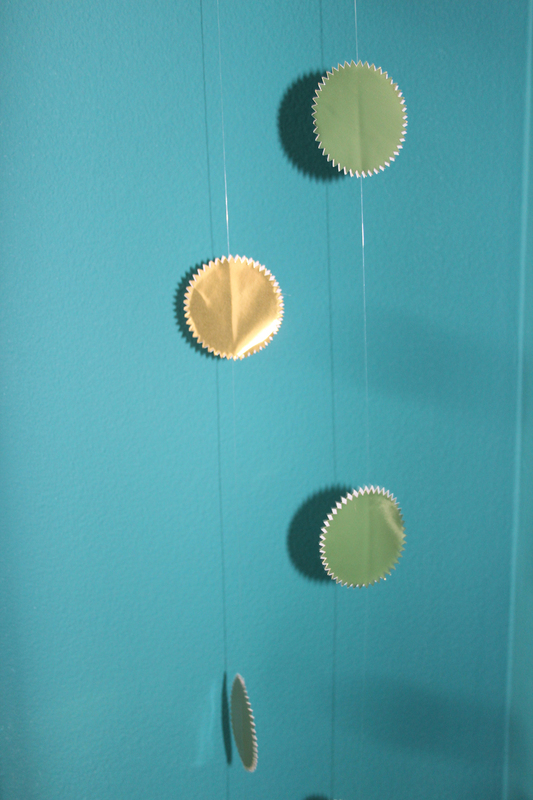 I have no idea why I didn’t take a full photo of the entire room, but here are the gold stars that were floating! She used those gold diploma seals and put them on fishing line. It honestly felt like magic. Totally copyable! 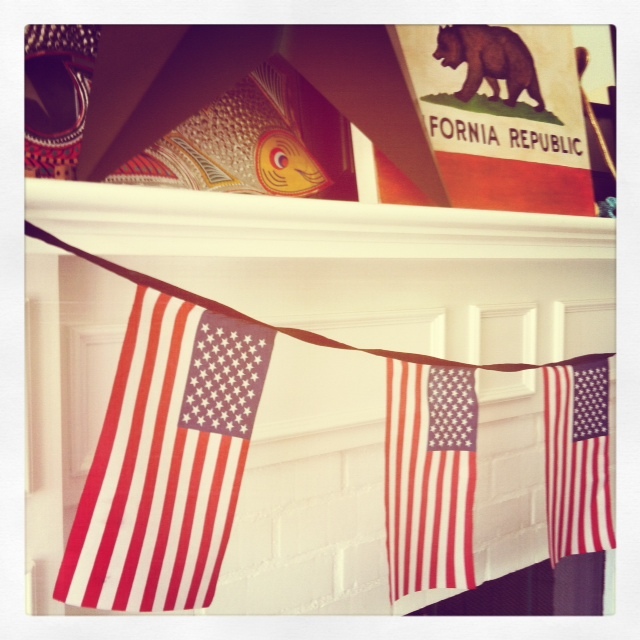 (She said she saw this idea on a blog somewhere but can’t remember where… we’re not trying to steal credit here!) 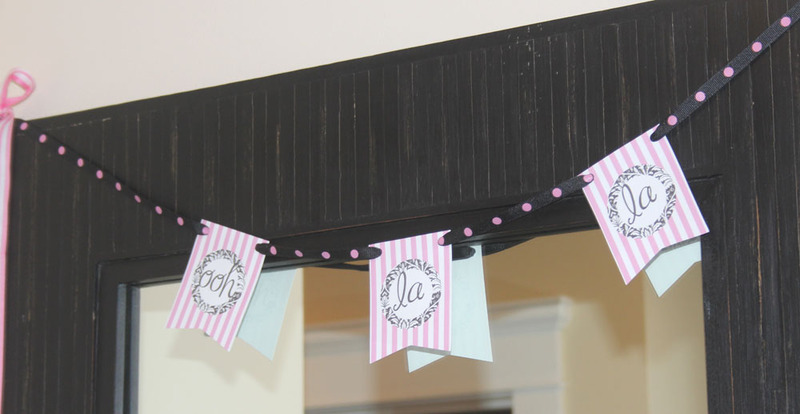 Anyway, a super cute idea and I especially love the surprise element of it all! I would love to do something like this to someone’s front door on their birthday. What a fun way to feel special. Ooh la la! 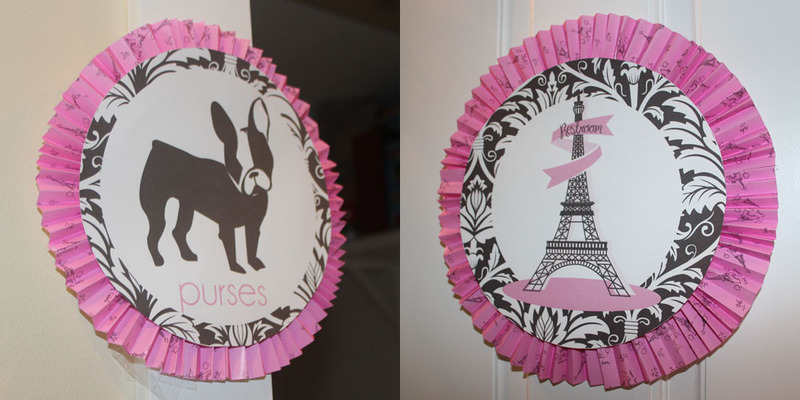 My friend Kasey is set to walk down the aisle in a few more weeks and to celebrate we brought Paris to California. 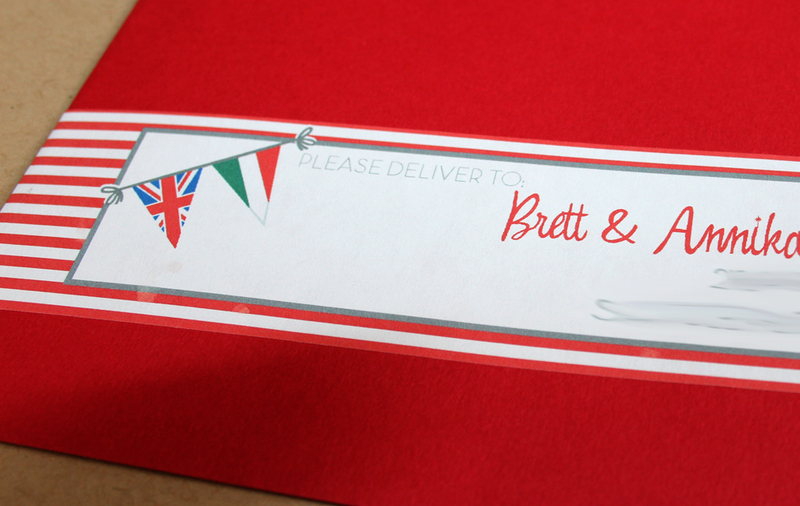 The invites (available in the shop soon!) 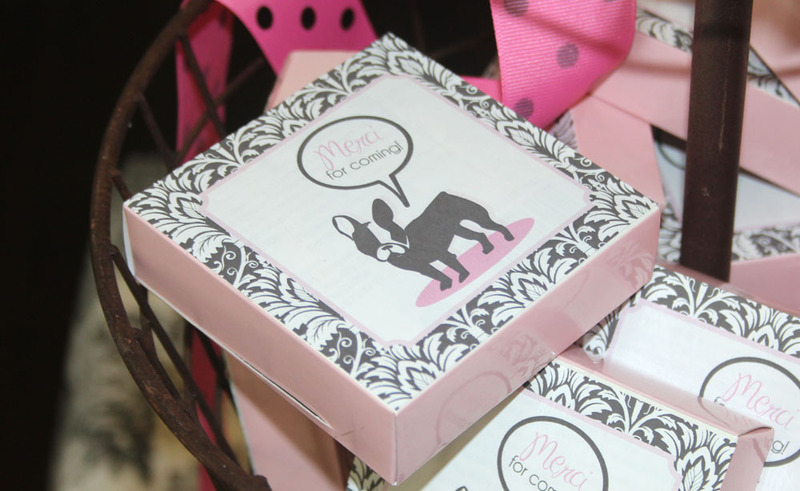 included a French bulldog since the bride has the cutest Frenchie named Olive and she’s mildly obsessed with the little thing! We had to have Olive represent! Come on in! (Crafty Jan gussy-upped this welcome sign, of course!) 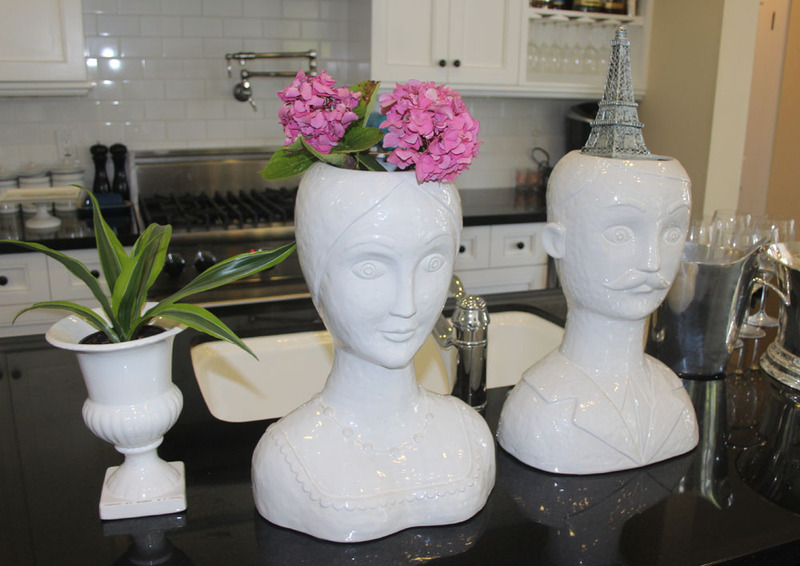 She has also previously hosted French-themed parties and I was lucky enough to borrow just about all the decor for the party… from the toile tablecloths… …to the bustier purses we used to put Trader Joe’s peonies in… …and all the other French knick-knacks. 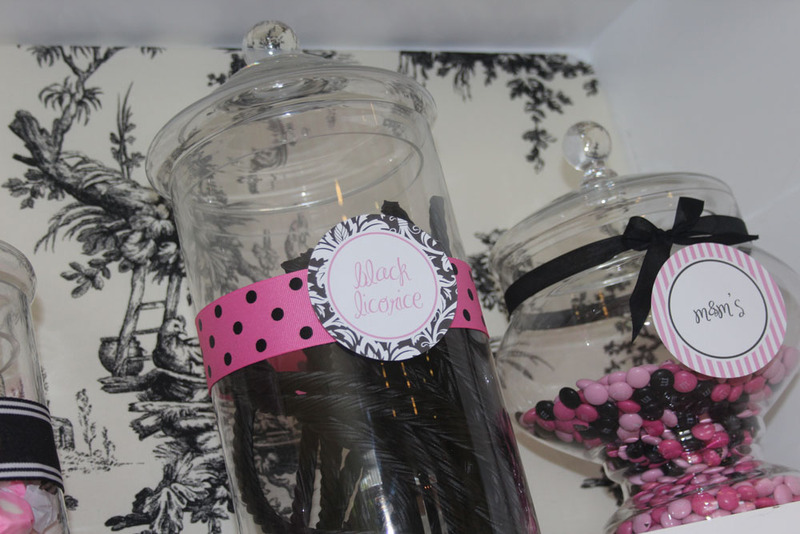 We strung black and pink lingerie from the ceiling (even though it was not a lingerie shower… It just screamed OOH LA LA!) 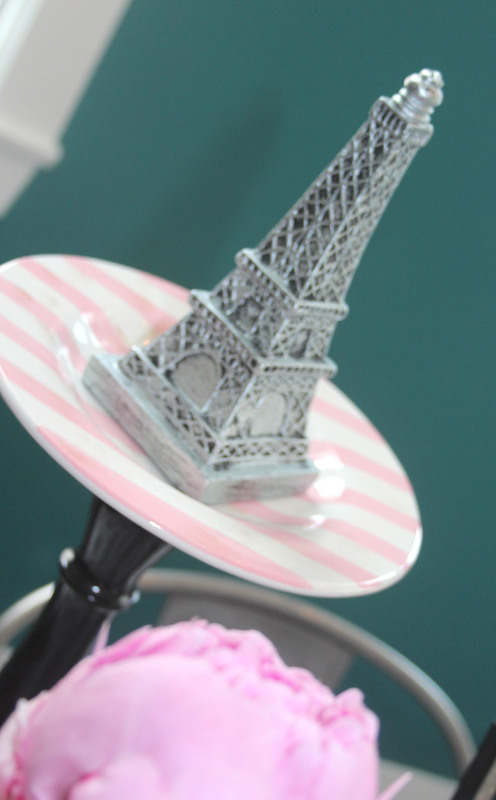 and put Eiffel Towers here and there and everywhere. 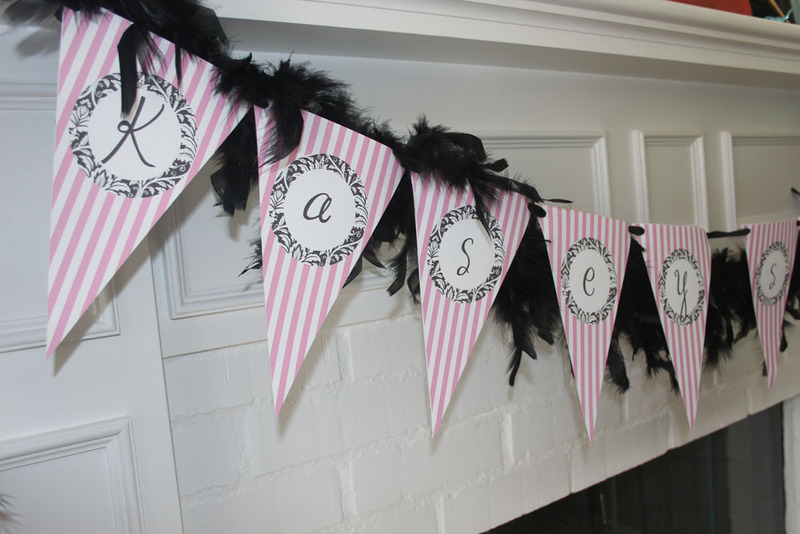 The mantle was draped with a feather boa & printable that said “Kasey Said Oui!” But I think everyone’s favorite part of the shower was “La Confiserie” … The candy shop! 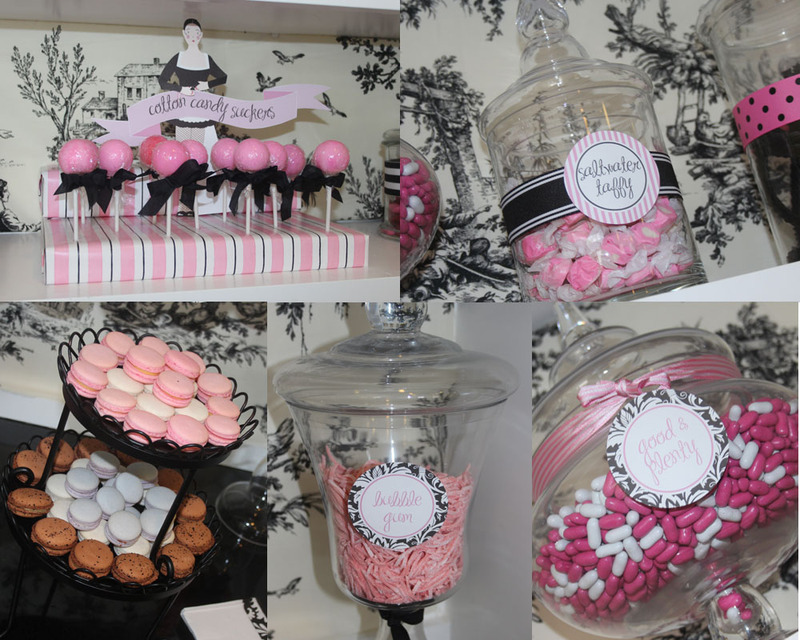 Serving all black and pink candy – and of course fresh macaroons – it was a hit. This is normally where my computer sits. 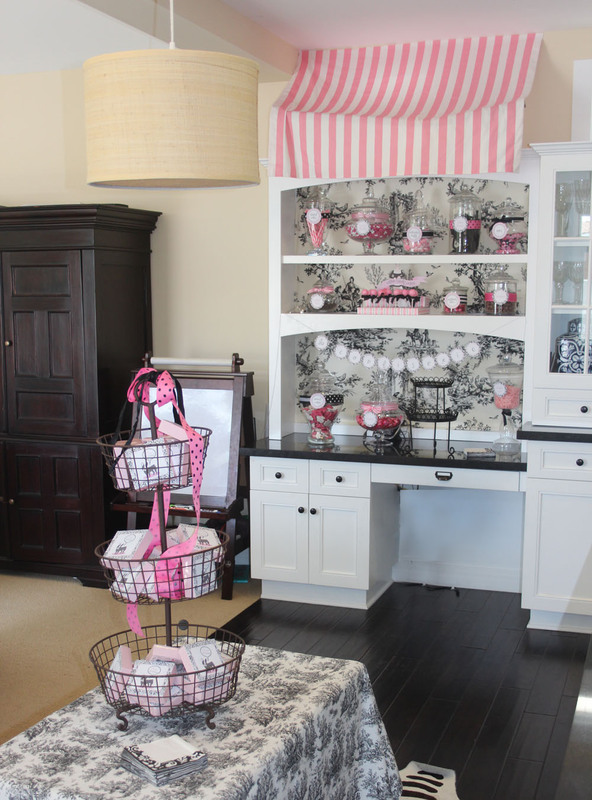 I used toile fabric to line the back of the shelves, then used pink and white striped material as an awning. 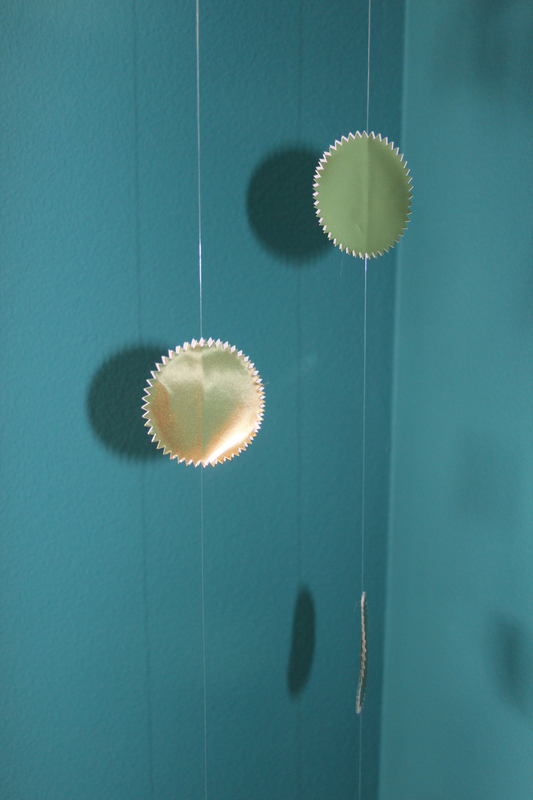 I threaded fishing line through wrapping paper tubes and thumbtacked the lines to the ceiling in order to create it. (A little disheveled in these pics but you get the idea.) How cute are those lollipops? They were 50 cents each from Walmart and had an ugly wrapper on them. Rewrapped in saran wrap, they got a fancy new look. 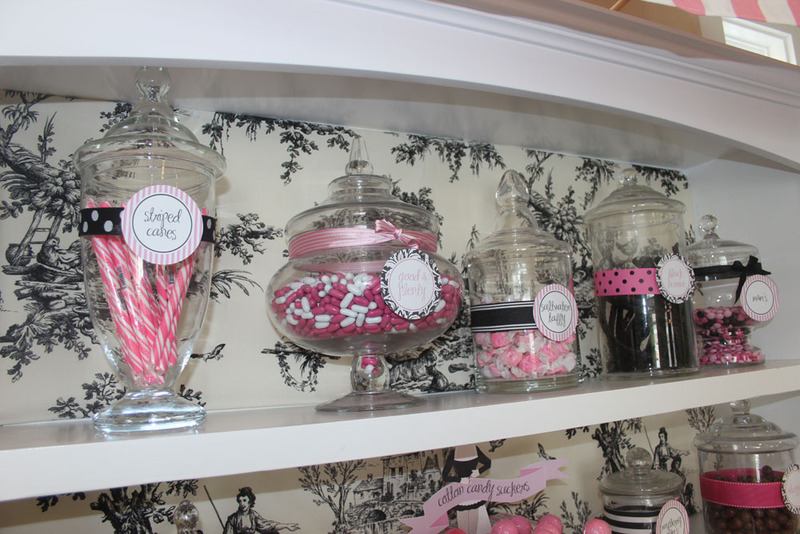 Here’s another shot of the candy shop. 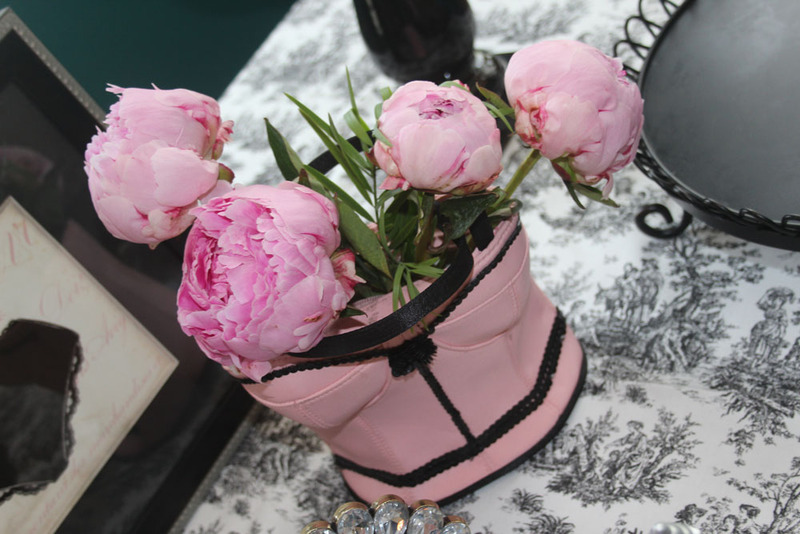 The favors were placed in a three-tiered basket and placed so that guests would remember to take them. 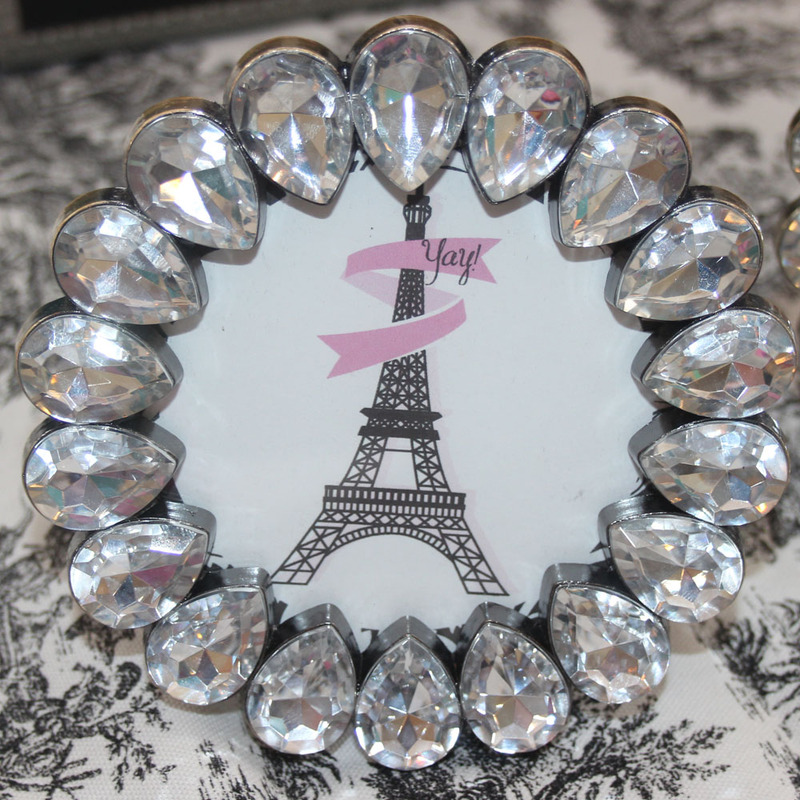 I made a label to place on the back of individual French Manicure sets from the dollar store. I’m sure they went straight to the daughters of the ladies at the party, but they were so on-theme, we couldn’t resist. (That’s what the front looked like!) More signs for purses and the ladies room. 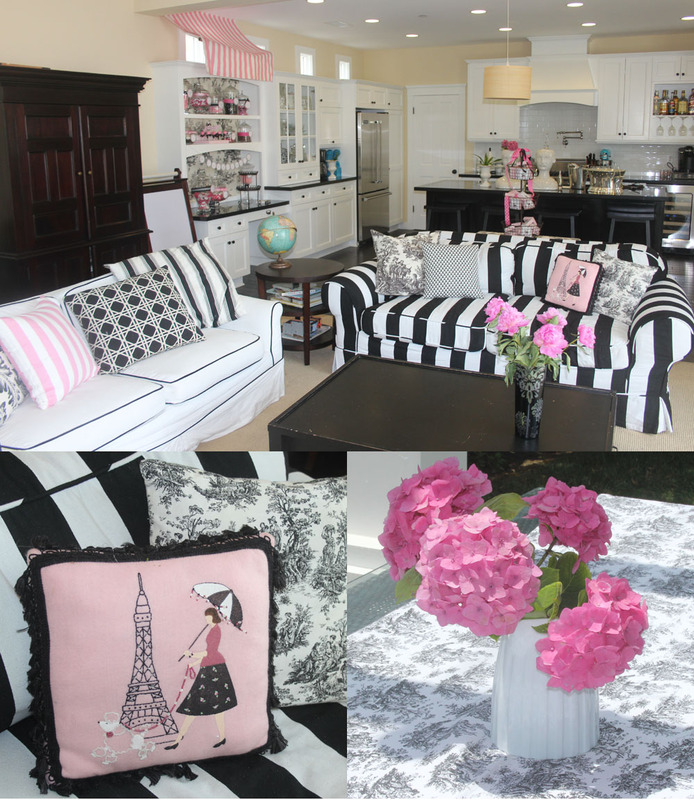 My couches happen to go fabulously with a theme like this! Ha! We added some pink pillows and hid the turquoise ones that are normally there to keep with the theme. 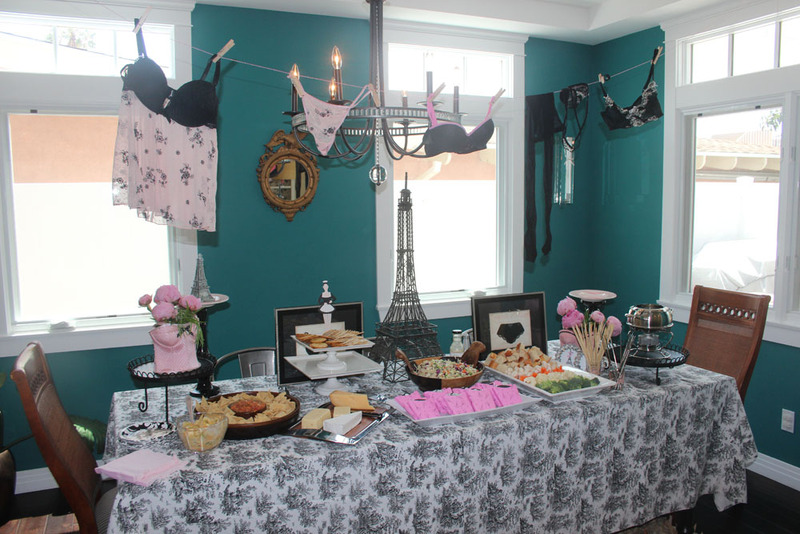 I hosted this shower with 4 other lovely ladies but we don’t all live close to each other. Since decorating was taken care of on my end, all the hostesses just brought an appetizer and a bottle or two of champagne and we were set. From fondue to french fries, we were feeling tres stuffed. 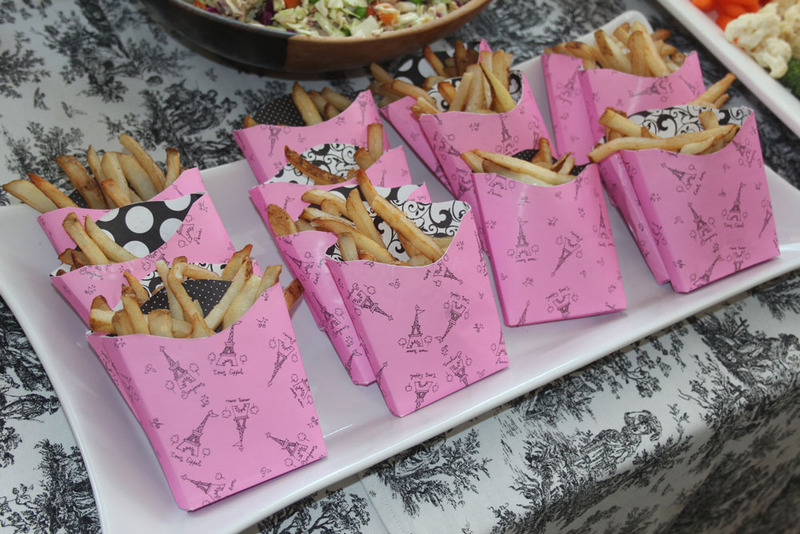 My mom made these french fry containers using her cricut machine. Unreal right? So cute. 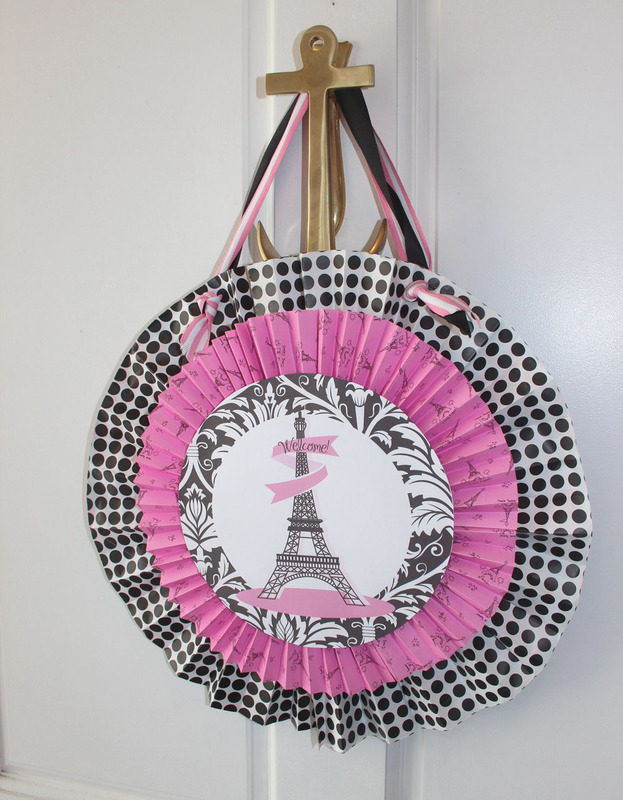 “Ooh la la” hung above our big mirror and “Tu est tres jolie!” was a nice pick me up in the restroom! 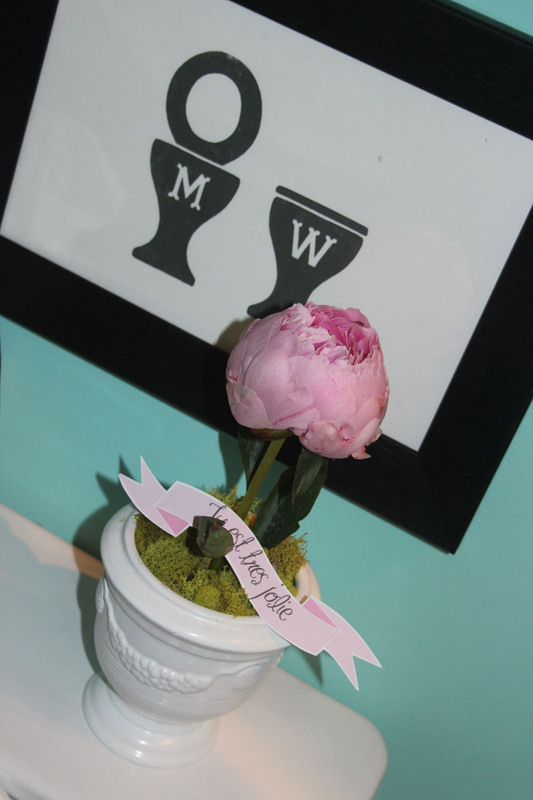 In searching for a fun/not-painful bridal shower game, I came across Make Merry Event’s blog post with FREE Wedding Vow Mad Libs. Hilarious. Easy. Quick. My kind of game. I wanted these Mad Libs to match the party, so I took her wording and redesigned it for this party. We had everyone group off into sets of two and they had to fill them out blind. (One girl wrote and asked “adjective.” while the other one came up with funny answers.) We had Kasey read them once everyone was finished and choose the vows she liked best. She chose the one that said something like “I promise to (present tense verb) lick your (noun) cottonballs for (period of time) 5 minutes.” It was hysterical. 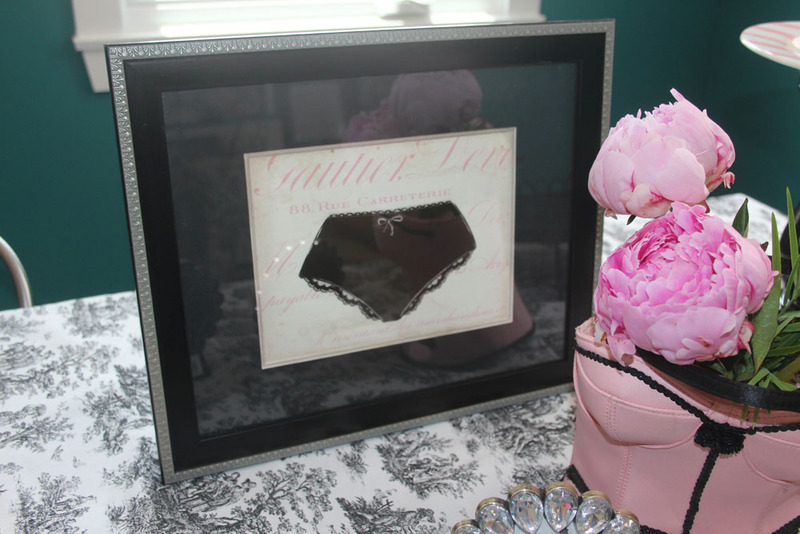 The winners got to take home these pretty frames scored from Home Goods. It was a fun day with some fabulous ladies. Ooh la la! Now all we have to do is wait for the wedding! The party gods shined upon us once again! 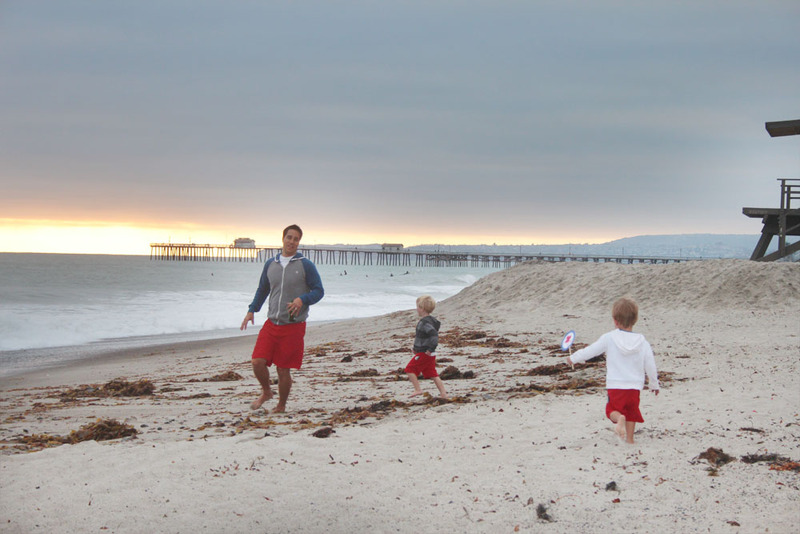 In the coastal parts of SoCal, June is kind of the worst month of the year. True story. (Ever heard of June Gloom? Well, it’s tooooooootally real!) 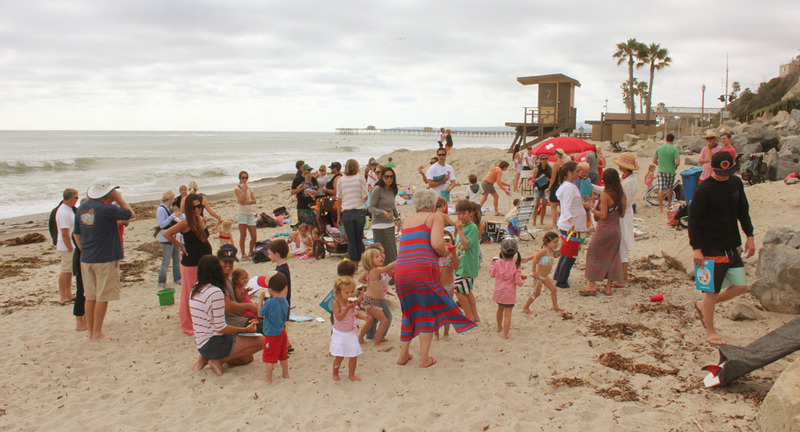 Anyway, we somehow picked the ONE day out of the week that was semi-sunny and warm for this beach party. What luck! The party was honestly sandwiched between two of the grayest (even rainy!) days we’ve had. So thankful for that! 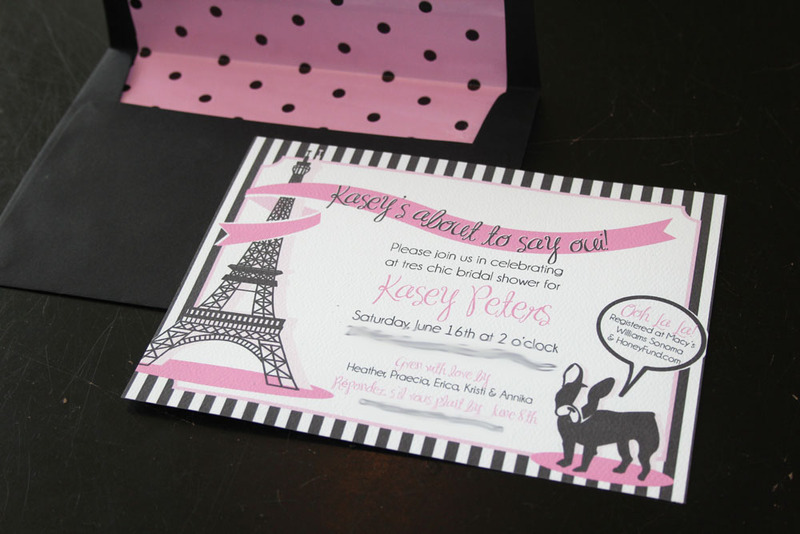 If you read the last post with the invitations, you’ll remember that my goal for this party was to K.I.S.S. (Keep It Simple Stupid! I think my math teacher used to tell us that.) And I think we kiiiiiiiiiinda did. I had a bunch of other wacky ideas swirling about in this noggin that I nixed in favor of simplicity… but I think the party was a success even without the mega bells & whistles. (Well… we had whistles. So without the mega bells.) In fact, I think it might have been better without them. Personal growth here, I’m telling you! I’m kind of laughing when I tell you that “I” put this party together because that’s TOTALLY not true! This shindig would not have remotely taken place without my amazing dad who took EVERYTHING over train tracks and rocks down to the beach (this means 5 folding tables, tons of water bottles, juice boxes, food, decorations, etc…), my mom who made 75 cupcakes & insanely adorable cookies, my husband who was a pack animal himself, and my fabulous parents-in-law and aunt & uncle who along with the aforementioned group of peeps took everything back up the rock hill, over the train tracks and into the cars after the party just so that my ‘vision’ would be achieved. And what, you ask, was I doing? Sitting in a beach chair like a bratty beach queen pulling the 8+ month pregnancy card. What a total lame-o! But THANK YOU ALL! Okay – let’s get down to business. 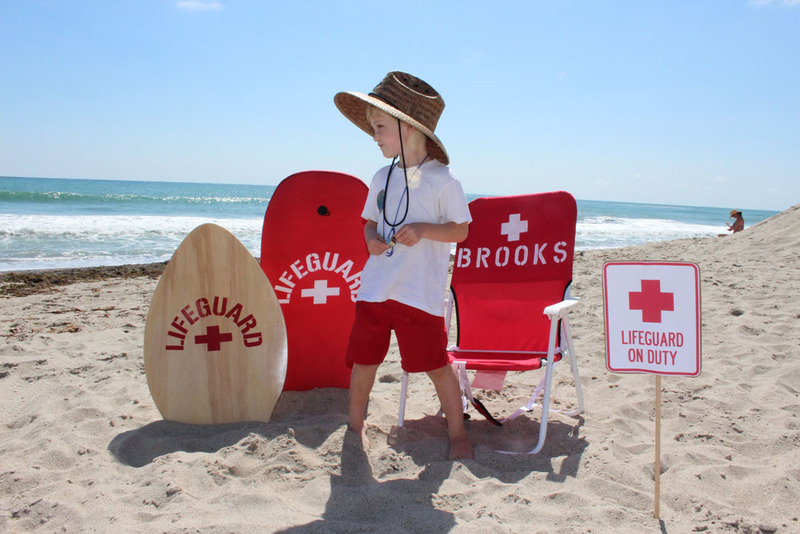 I guess I should mention that my son chose a lifeguard theme because he is… duh… obsessed with lifeguards. We’re down at the beach a ton and we have friends who are lifeguards so he’s pretty into them. In fact, he’s so into them that he actually thinks he IS one. He actually spent the last half of the party ‘guarding the tower.’ I loved his idea so we went with it! 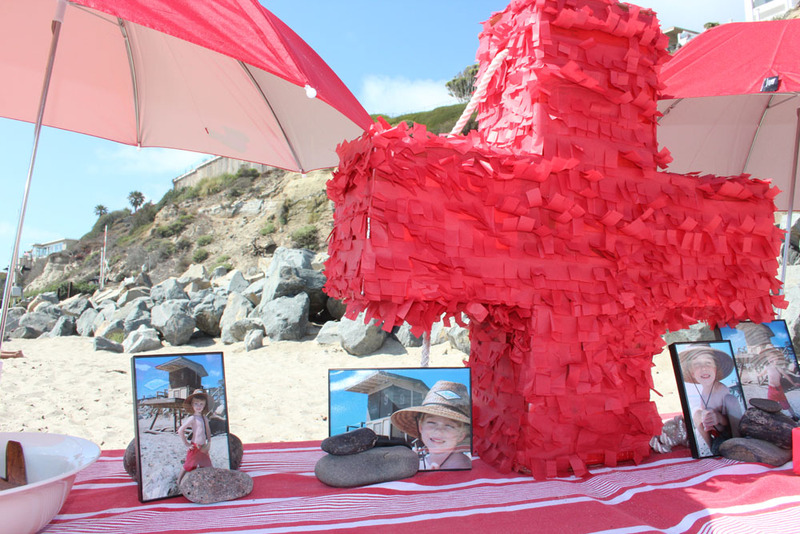 I painted his name and a lifeguard cross on a cheap red beach chair…. 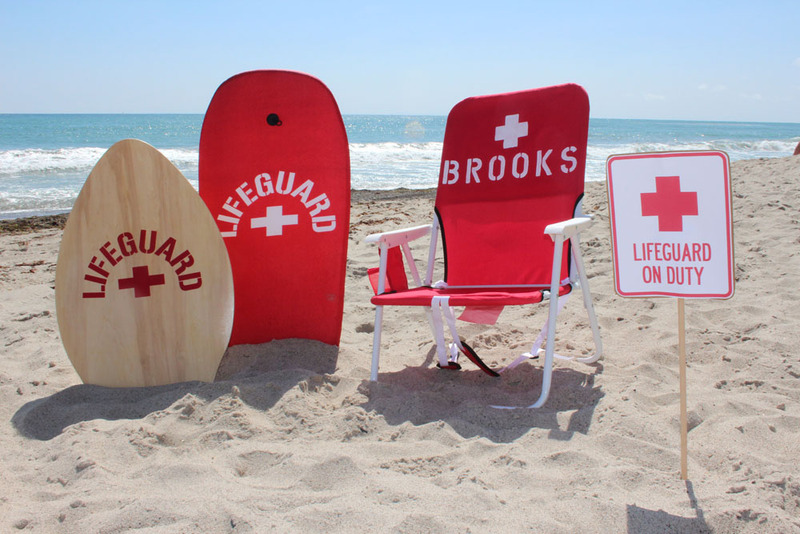 … and my mom scored these nuggets of lifeguard props at Home Goods – a skim board and boogie board for under $10 each! Seriously? Done. Forgive the pics – they were taken before everything was really ‘ready’ but you get the idea. I painted more white crosses on clip on $5 red umbrellas from Walmart. I also painted a huge read beach umbrella the same way but never took a photo of that. Use your imagination. Or wait… just look at the photo above and blow it up in your mind. Got it? Good. I searched the WWW for an appropriate piñata but had no luck. My husband had just gone camping the weekend before so I stole the tent box and made a one that would keep my eyes happy. (For those interested, I taped it all together using an additional box, spray painted the whole thing red, then covered it in tissue paper that I cut to look fringe-y.) Normally I would say that this was the PITA* but it totally wasn’t. It was pretty fun to make. 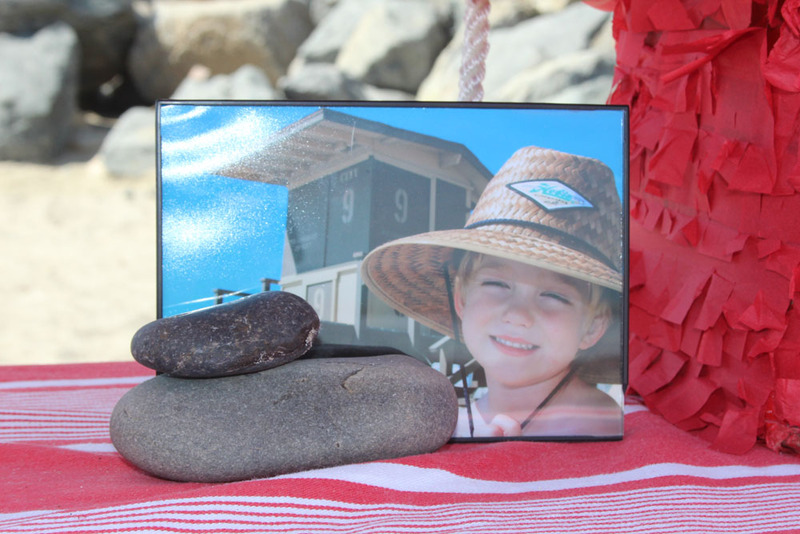 (For those of you who aren’t familiar with my language yet: PITA = Pain In The A**) Earlier this month, I had taken some photos of my birthday boy by a lifeguard tower. I got 99 cent plastic frames from Walmart and put a few of them in there. You get what you pay for and they wouldn’t stand up so I collected some beach rocks to prop them up. Sometimes things like that are blessings. So much cuter with the rocks holding the frames in place. The party was from 4-6pm so we just ordered pizza, got a chicken salad from Costco, some grapes and veggie trays along with the cupcakes and cookies and that was that. 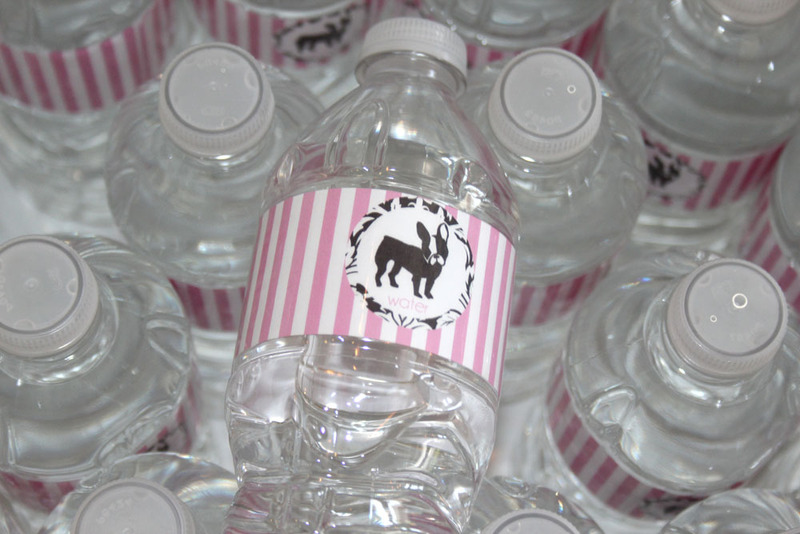 Water got dressed up for the occassion but it was the first party I think we’ve ever thrown without alcohol! I didn’t know we were capable of that! 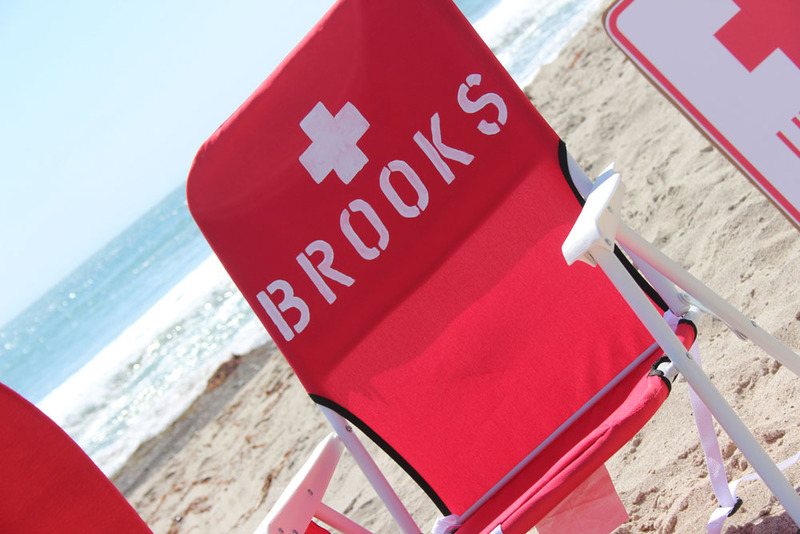 It’s illegal to drink on the beach – which helped us out in the K.I.S.S department. Less to bring down (not that that was my problem! Ha!) and no one seemed to mind. 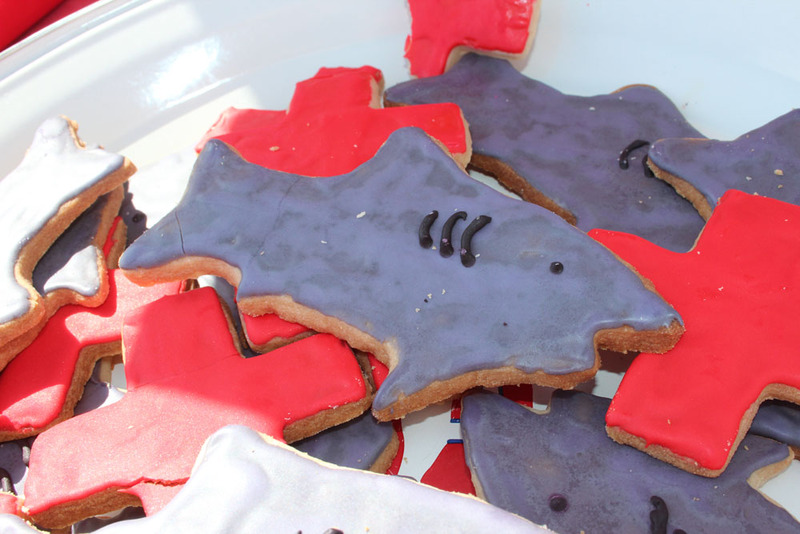 The birthday boy is actually kind of an artsy dude and he had one major request from Crafty Jan: Shark cookies. Good thing she can deliver. 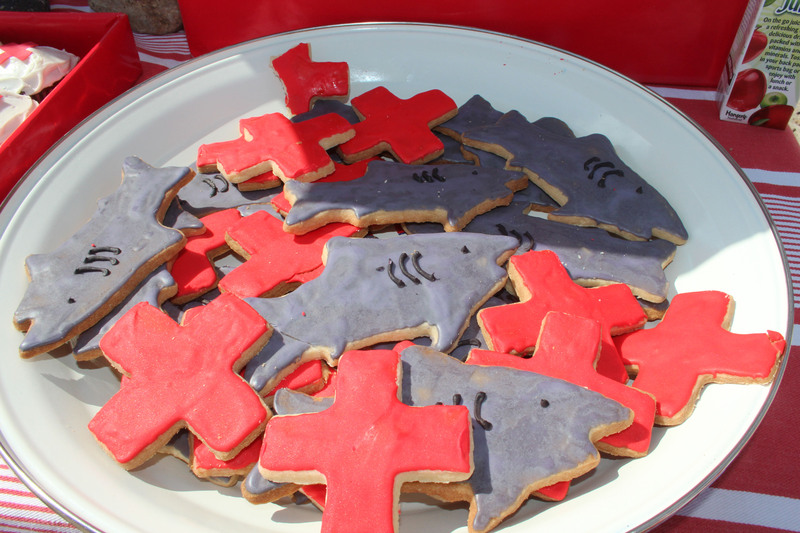 These sharks swam fast… right into the bellies of all the little lifeguards at the party. 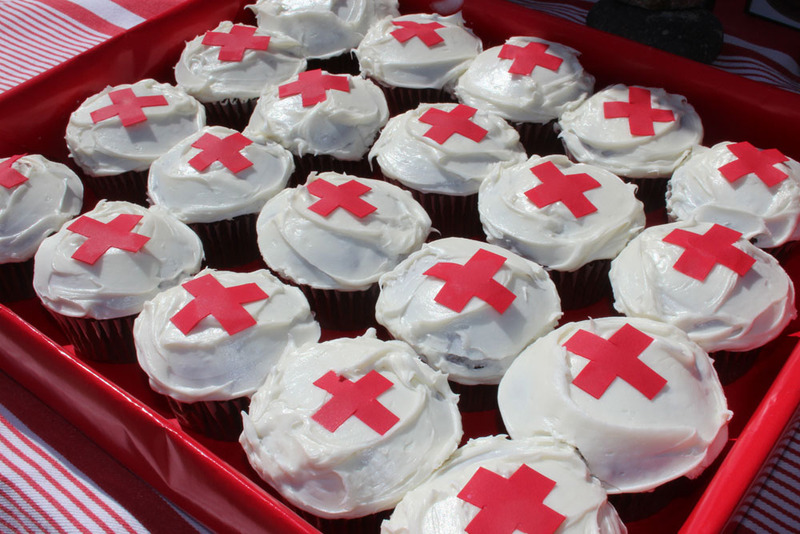 Crafty Jan also made the cupcakes… all one million of them! I swear there were so many and I was SO thankful for her help! See how little I did for this party? She used edible sugar paper for the crosses. How clever is that? She even made the new 4-year-old a super special big one. 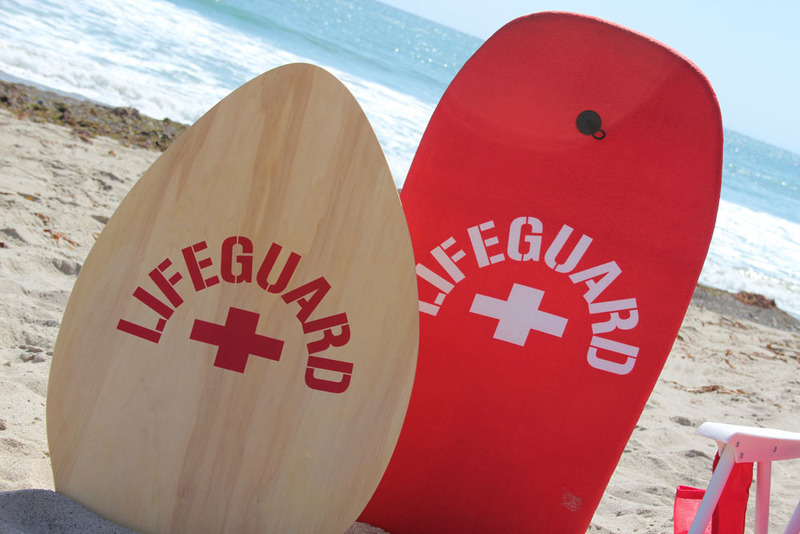 Since lifeguards HAVE To have red trunks, that was a no-brainer. All the boys in my family wore them. 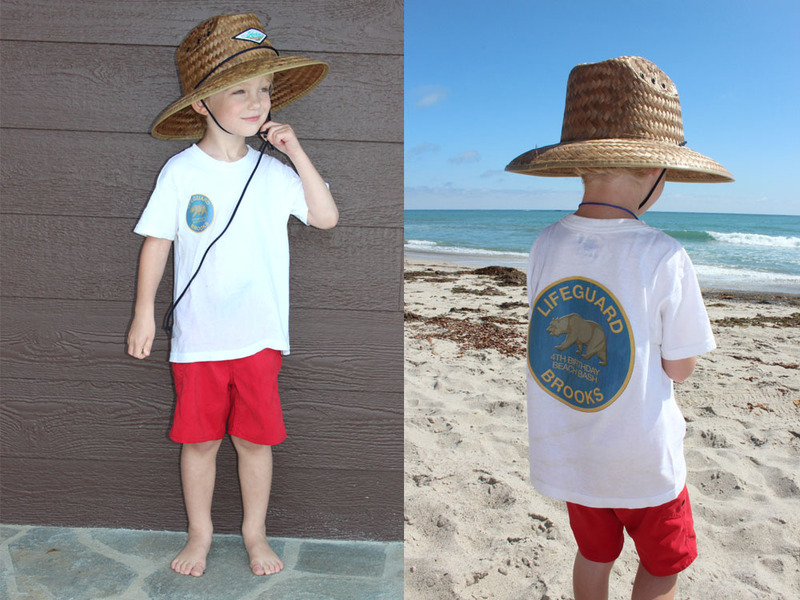 But we got Brooks a pint-sized lifeguard hat from Hobie and I ironed ‘his’ logo onto a white shirt so he would look legit. As favors we gave each kiddo a whistle. What. The. Hell. Was. I. Thinking? I swear! I’m pretty sure I made some parental enemies after that decision! “Hey kids! Come to a party, eat lots of sugar, and I will send you home with an ear-piercing whistle.” Awesome. I’m sure next time he goes to one of his friend’s houses he will come home with a drum set in retaliation. 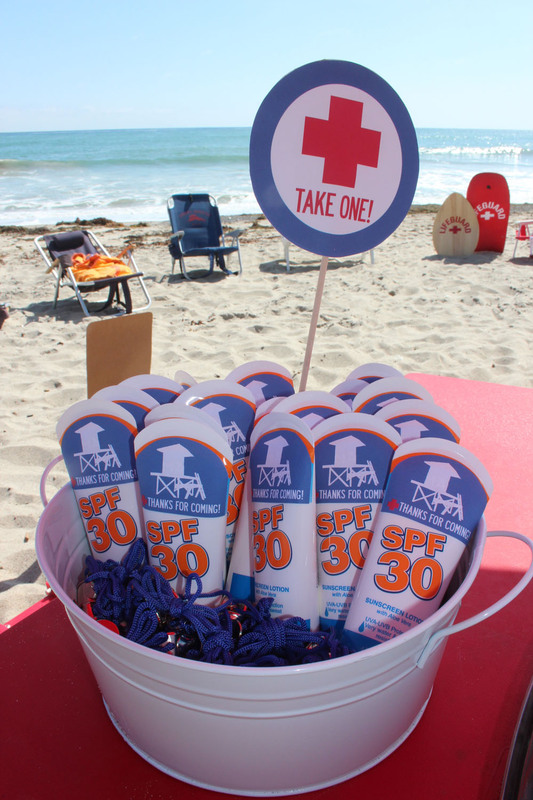 I was also set on giving out sunscreen – but if you’re a beach bum like we are – you know that this stuff isn’t cheap. Well… it is at the dollar store! How much? Uh… less than a dollar! 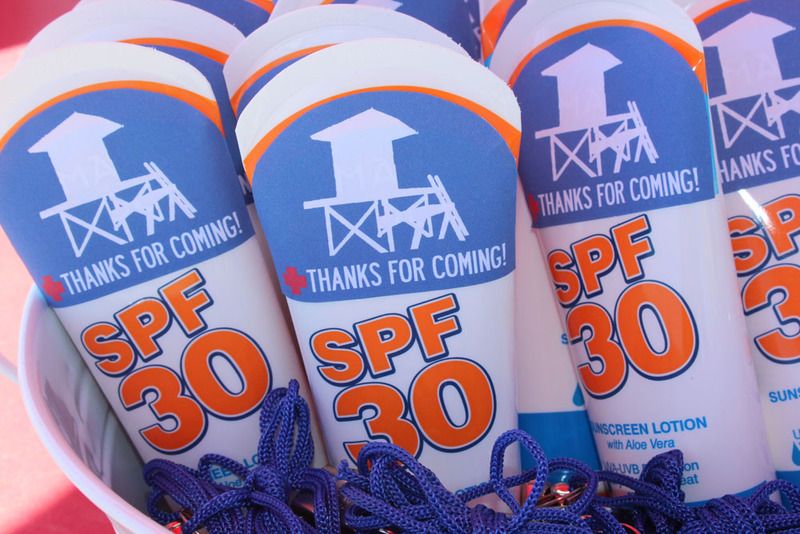 (Though I wonder how potent dollar sunscreen is. It’s gotta be expired or something, right?) It was the idea I liked… I guess I didn’t really think about the fact that we may have sent everyone home with ear-drum ruptures and burnt skin. It pained me so that the sunscreen was orange and not red, but in my new desire to keep things on the less wacko side, I just put a “thanks for coming” sticker over the orangest part of the tube. (What is wrong with me? 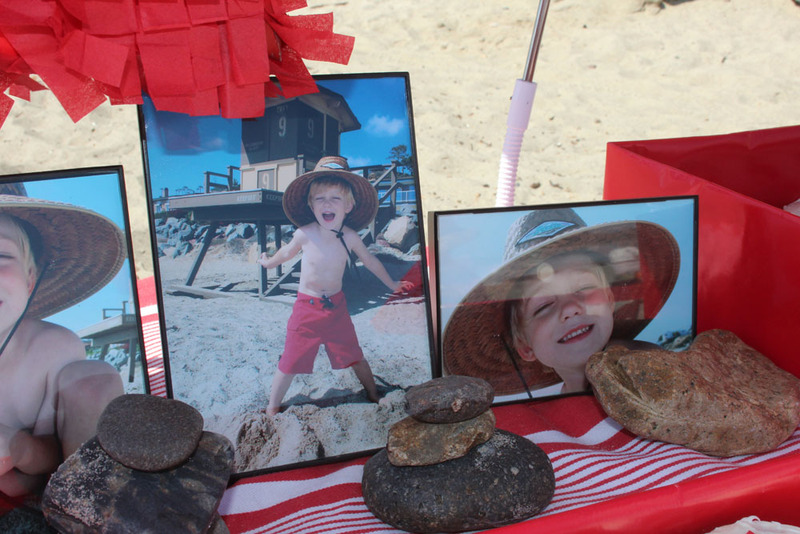 I was thisclose to getting out red nail polish and painting in the “SPF 30.”) So that was basically it as far as decor went – though what you’re not seeing are 3 cute kiddo tables and the big red umbrella. I haven’t really been myself this pregnancy as far as taking photos. Now onto the really cool part of the party! 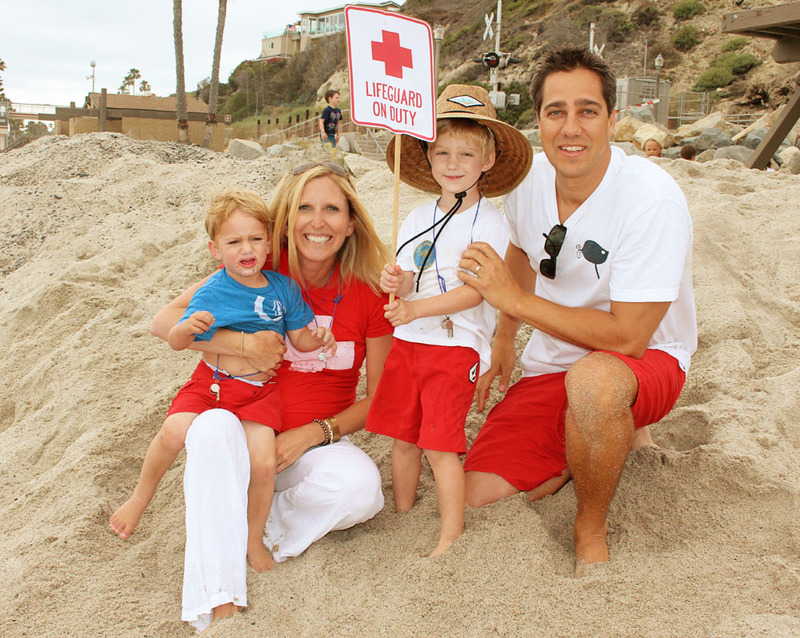 The lifeguards! We are fortunate to have really, really, reeeeeeally cool friends. Friends who do your kids really, really, reeeeeeally amazing favors. 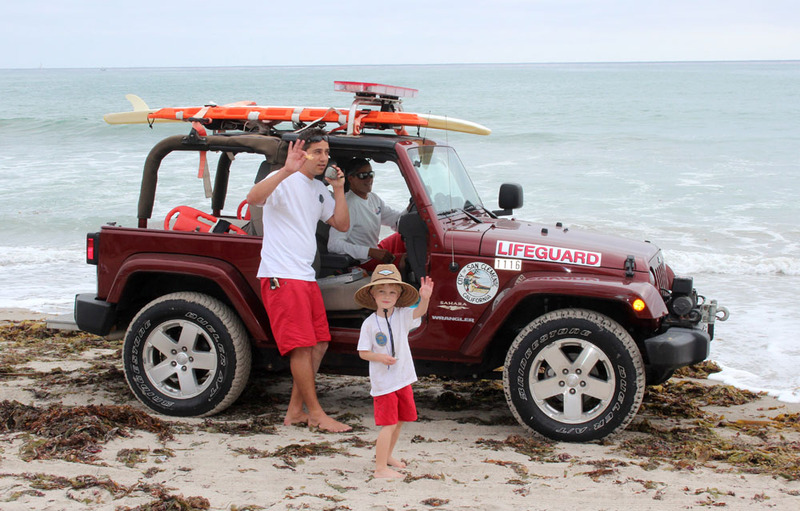 Friends who are current & ex-lifeguards who stop everything in their day to make your kid’s birthday the best day of his life. Yep. That’s the kind of people we know and we are BEYOND grateful, you have no idea. 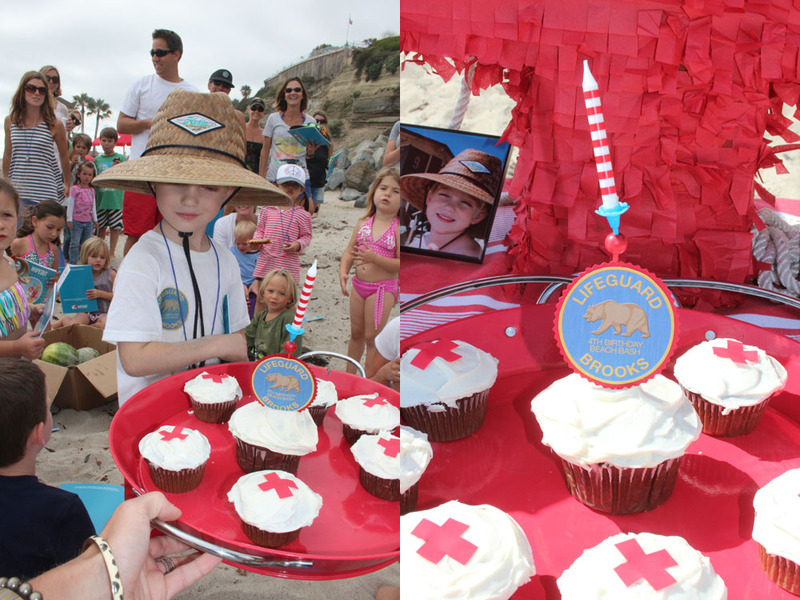 Our friend Alyssa is a current lifeguard and got the OK to give a ‘public ed’ for our party of lifeguard wanna-be’s. 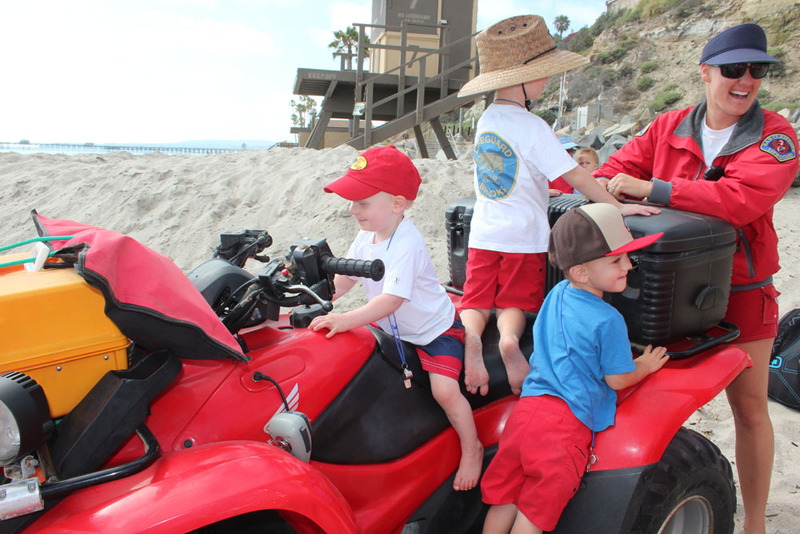 She drove her ATV down to our tower and let all the kiddos crawl all over it. Can you imagine how insanely cool you would feel as a kid doing something like that? Um… they did! 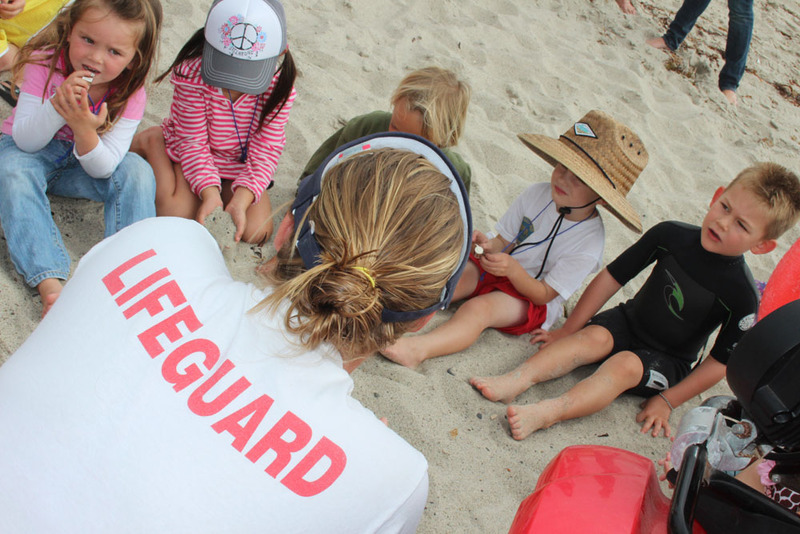 Then she sat them all down and talked to them about what it takes to be a lifeguard. How cute is that? 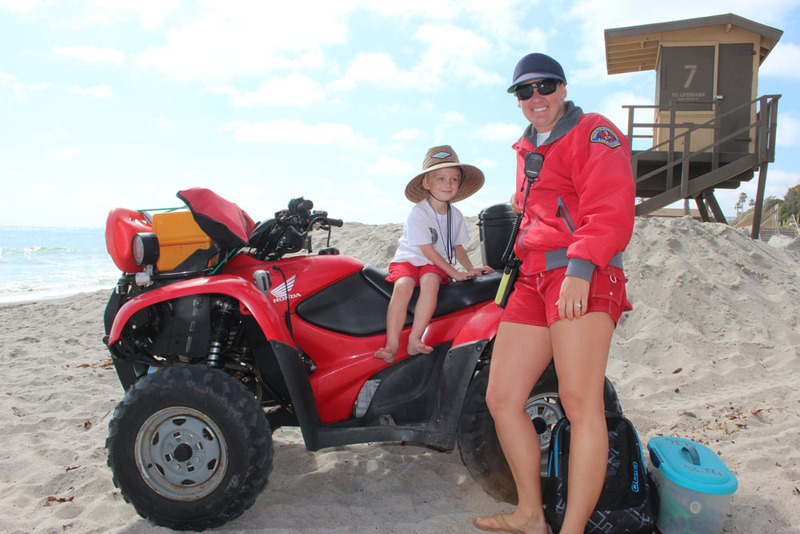 Our other incredible friend, Laurie, happens to a former lifeguard as well (and she was also a Jr. Lifeguard instructor which was perfection!) and the two of these gals basically ran the entire party for us. 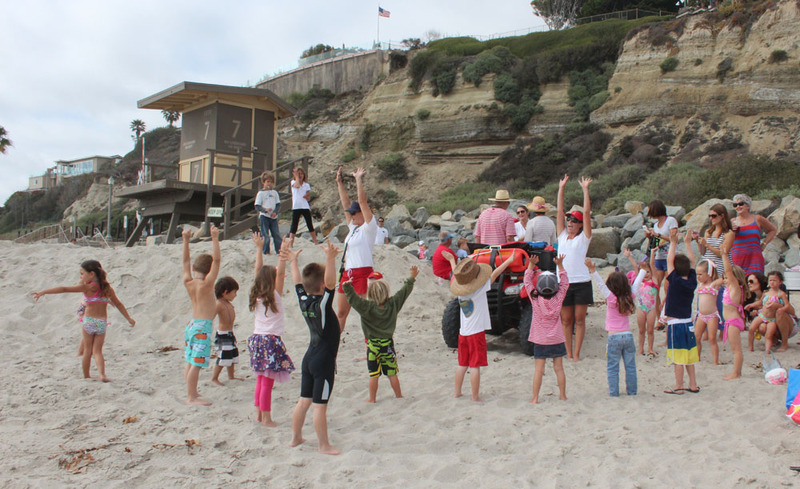 They had all the kiddos stretch and warm up for lifeguard training. Isn’t this the cutest? Then it was time to get down to business! 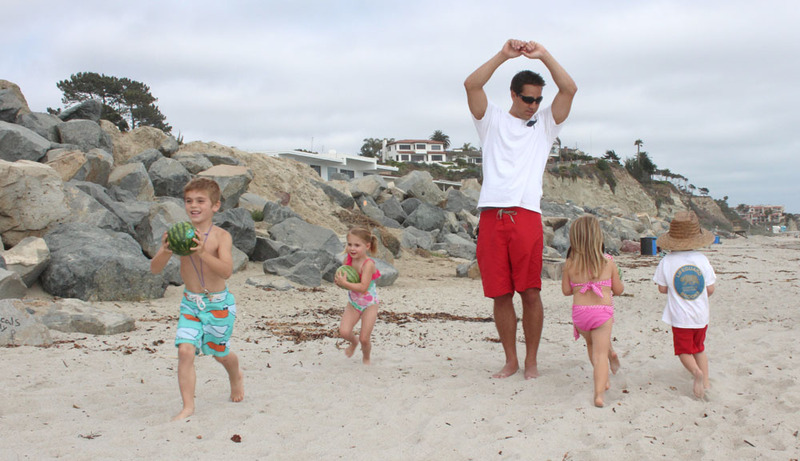 After running around the lifeguard tower to get the blood flowing, Lifeguard Laurie had the kiddos do Watermelon Races around my husband. (Alyssa had to take the ATV back to HQ… how pro did that just sound?) 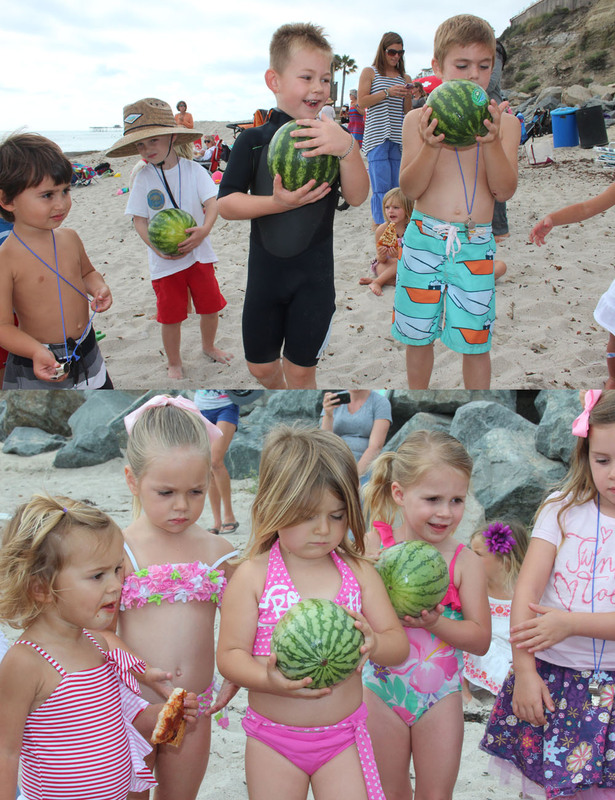 These weren’t just ordinary watermelons though. They were lubed up with Vasoline to make them slippery. It was so cute to watch them trying to keep hold of these suckers! 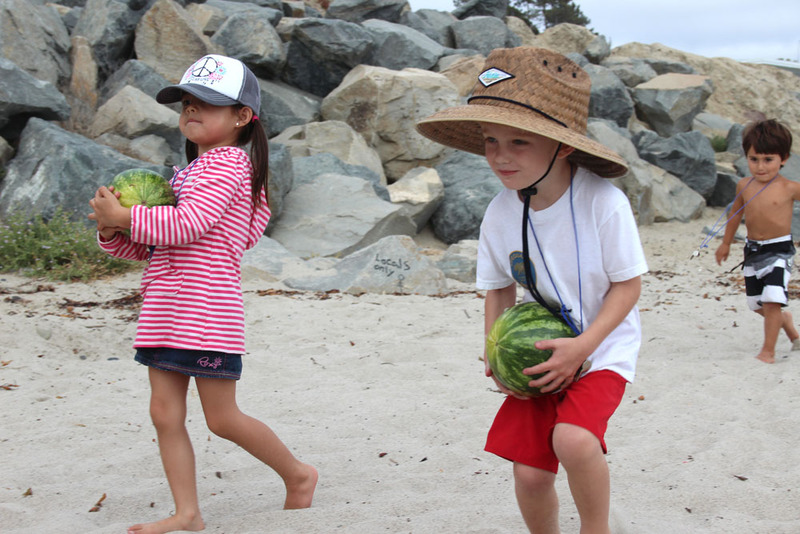 The watermelons were practice for if you had to pull a slippery person out of the water. Good training technique, don’t you think? Next we got out four hula hoops and the kids had to dive through them like they would dive under a wave. I don’t have photos of this because I was helping hold the hoops but it was also a hit. 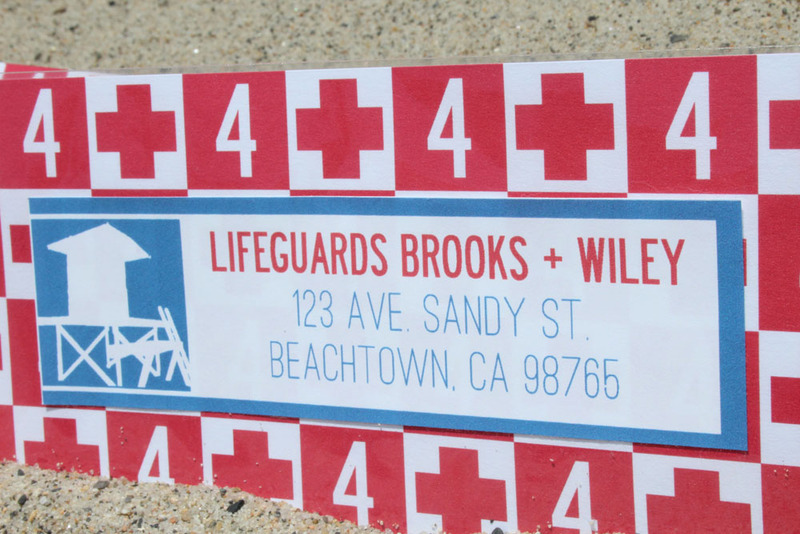 Alyssa left Laurie with some “beach flags” which are cut up pieces of hose and are used in Jr. Lifeguard training all the time. Laurie had all the kiddos lie on their tummies facing me, while she and Lifeguard Assistant Brett (my huz!) hid the beach flags all over the beach behind them. They had to jump up really quick and grab as many of the hoses as they could. (This is the 4-year-old version of this game. There is a more sophisticated version for older kids.) The crew ate it up! They loved it! And we loved the fact that they were getting so tired. 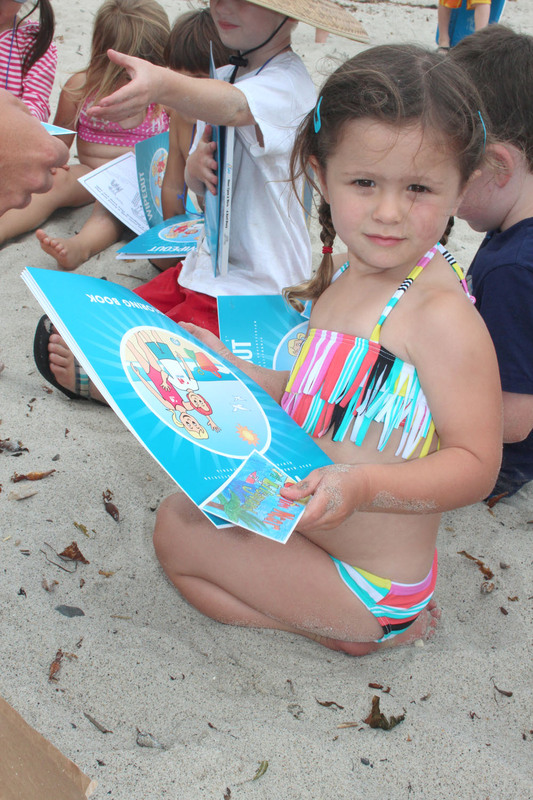 As if it couldn’t get more legit, Alyssa left each kid with a lifeguard coloring book, bookmark, and tattoos. Isn’t that soooo awesome? I honestly have the best friends in the world. I am still so humbled that they would help me out like this. 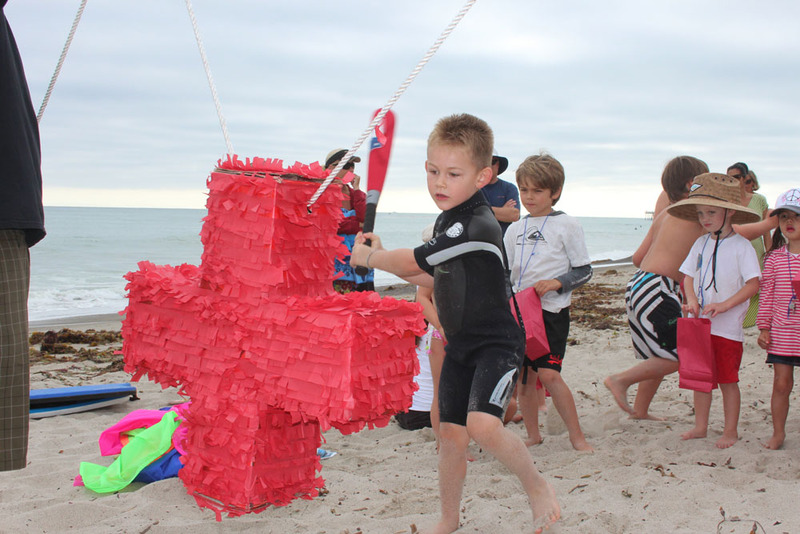 We took a break from the games for awhile but just when it was time for the piñata, a lifeguard in a jeep drove up. He was nice enough to let Brett use the PA system to call all the kids over to take a crack at it. I really love our town. Nicest people in the world, I swear. We grabbed two of the dads that were there to hold the strings of the piñata since there was no real place to tie it up, and note to self: tent boxes are pretty indestructible. We kind of ended up dumping out all of the candy after everyone got a good crack at it and the thing still wasn’t broken. I guess that’s why you don’t DIY. I found red lunch sacks at Target for suuuuuuuper cheap (look in the ziploc bag section! They have navy blue too!) 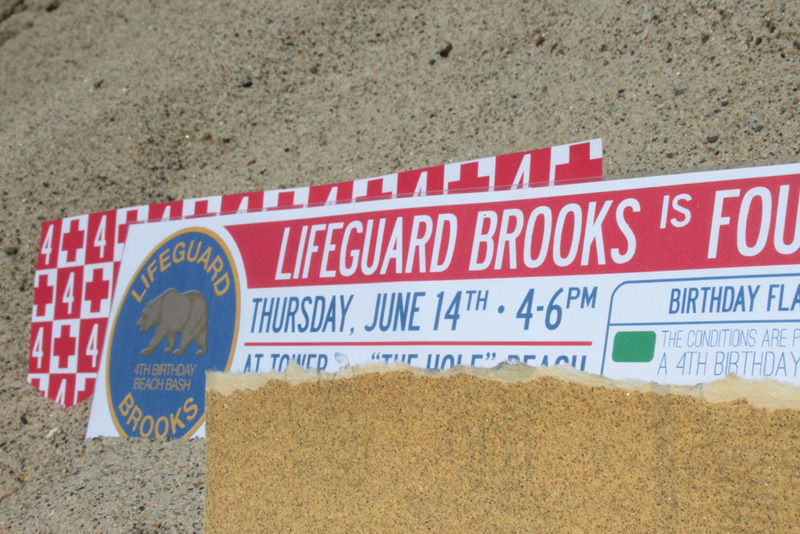 and just put a sticker on them that said “Brooks is Four” so kids could scoop up the candy. Didn’t really get a detail shot of those, but you get the idea. 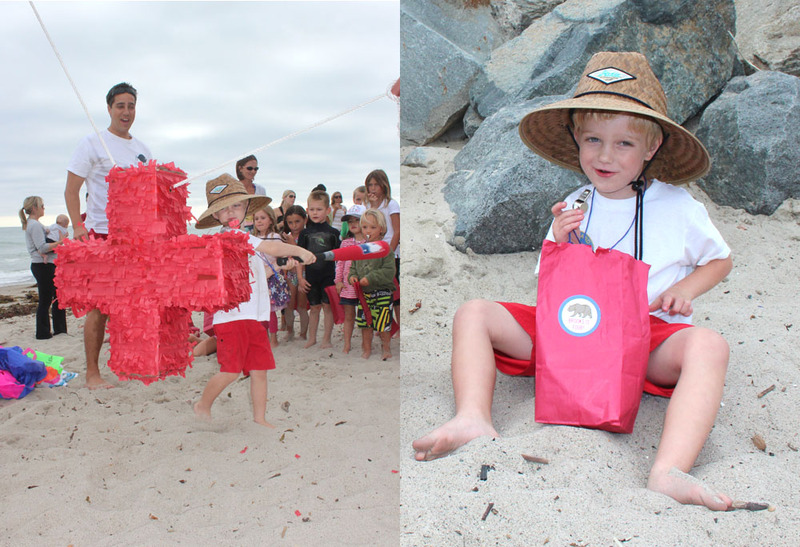 We had a big parachute that we were planning to use underneath it so that the candy wouldn’t be buried in the sand, but the littler kids thought we were going to play with it. Therefore, sandy candy for all! 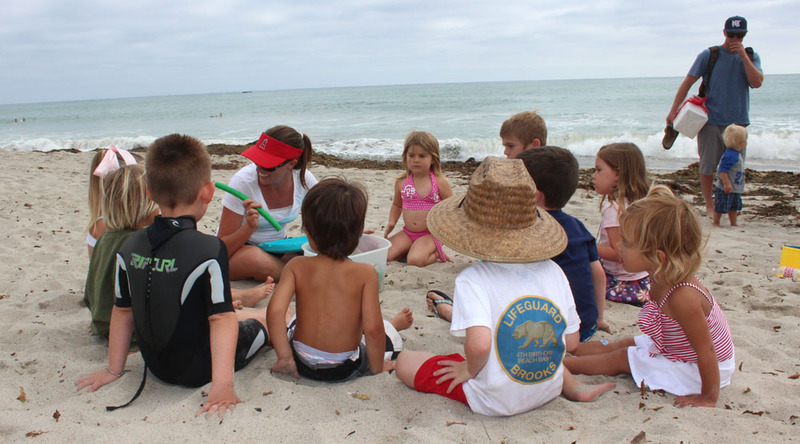 We nixed the parachute and I am sure we sent each kid home with a chocolate, sugar, and sand combo plate. 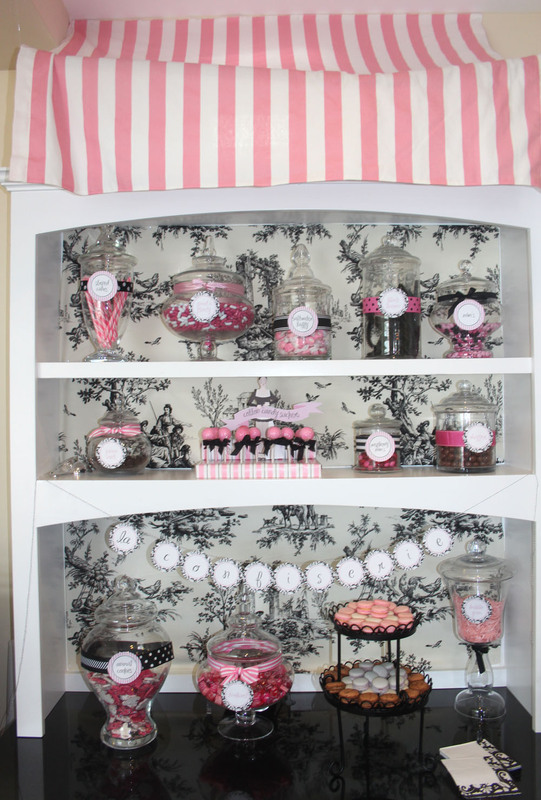 I mentioned I tried to keep the party small in the last post… Well, above is what a small party looks like in my head. It was perfect – even if it was not necessarily small – and I love everyone in that photo. I just don’t do small well. This kiddo had the very best day in his entire life. 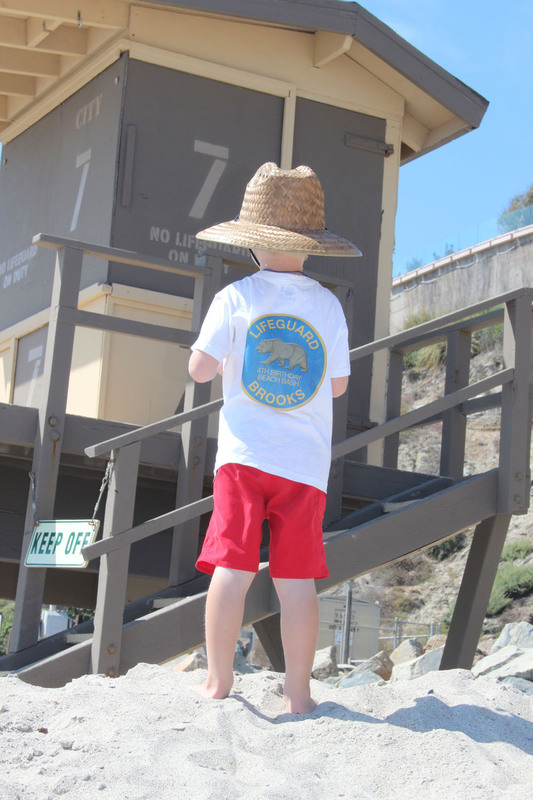 We took him to the beach this weekend and he did NOT want to put on his blue trunks. 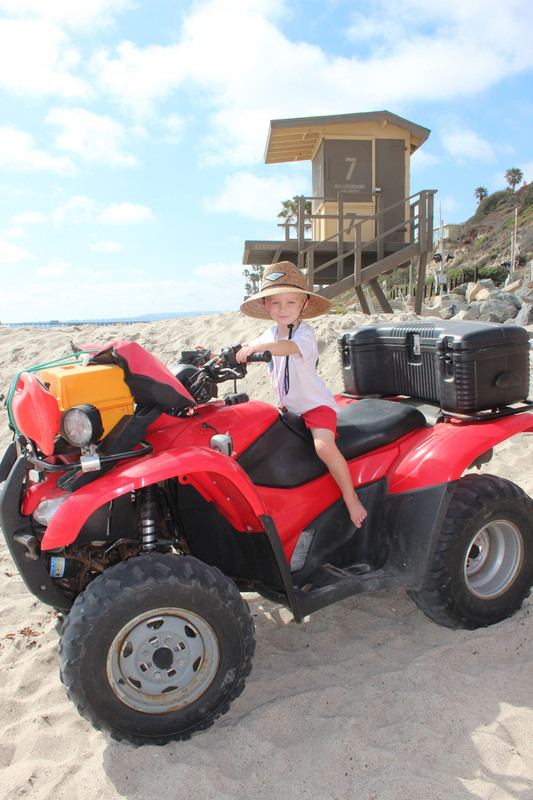 He only wanted his lifeguard trunks. I have a feeling there will be holes in these red ones by summer’s end. 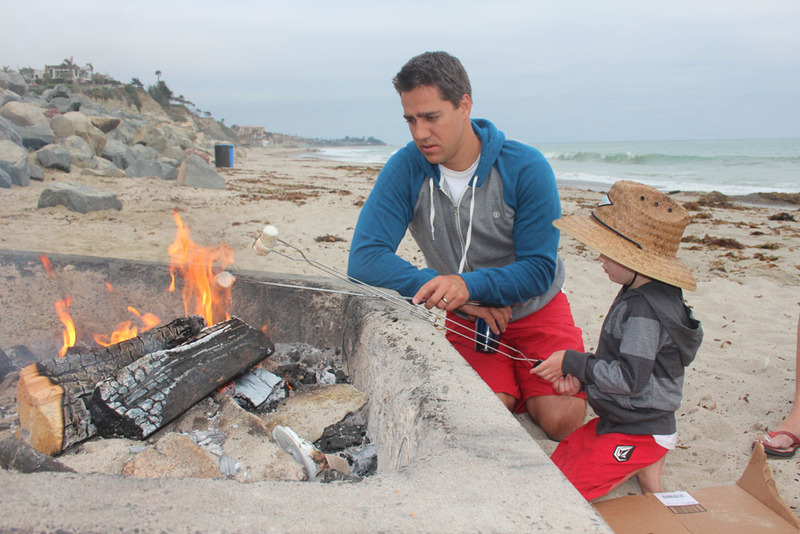 Speaking of ‘the end,’ after all of the manual labor I forced upon my incredible family in getting all of our gear back to our cars, we stayed down at the beach with both sets of the grandparents and my aunt & uncle and roasted marshmallows (and may or may not have snuck some vino down there. 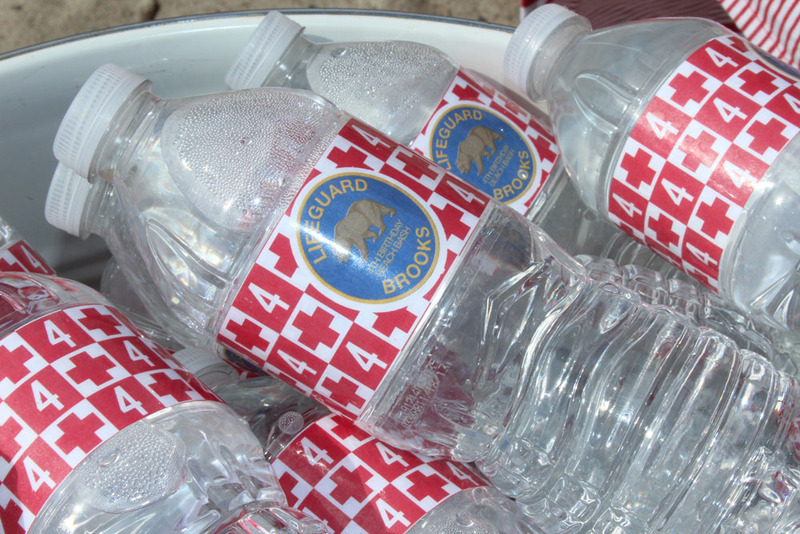 Shh… Don’t tell the lifeguards!) It was the perfect way to end the day. And let’s face it… my boys needed another hour or so of running all that sugar off! 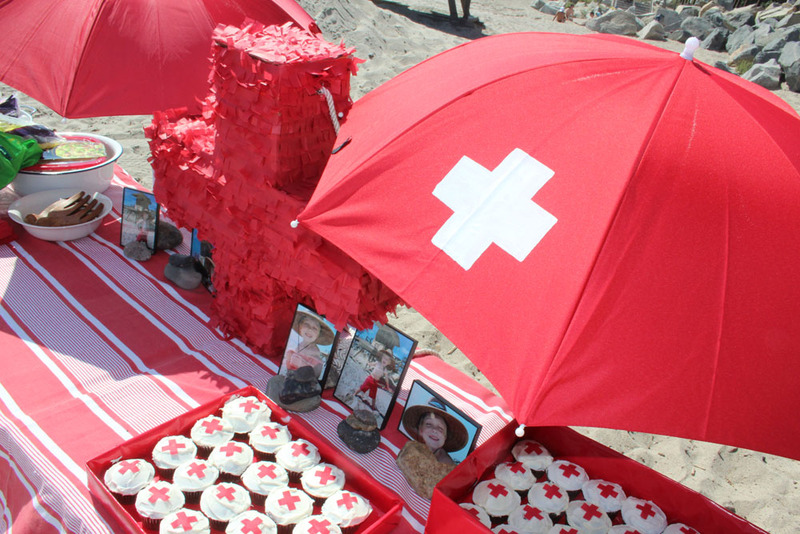 Lifeguard Cakes signing off! 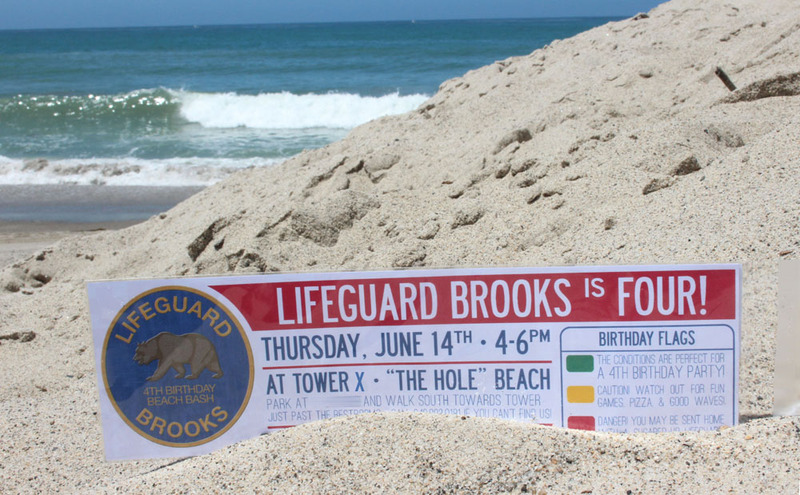 My lifeguard’s son’s 4th birthday party is this Thursday which also happens to be his last day of preschool. Double celebration time! 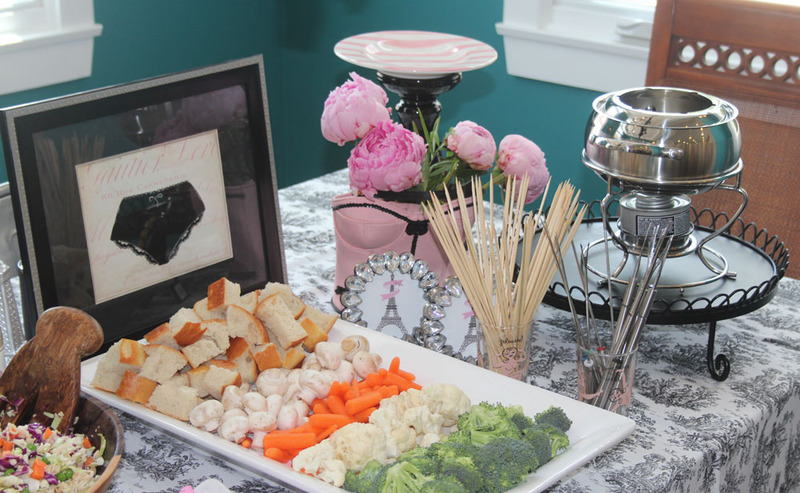 It was my goal for this party to keep things SUPER simple and NOT go overboard. It’s hard for me to pull in the reins because I really looooove thinking about parties. Like dream about them and stuff. I’m not saying this a good thing. Actually, if you think about it, it’s a little messed up. 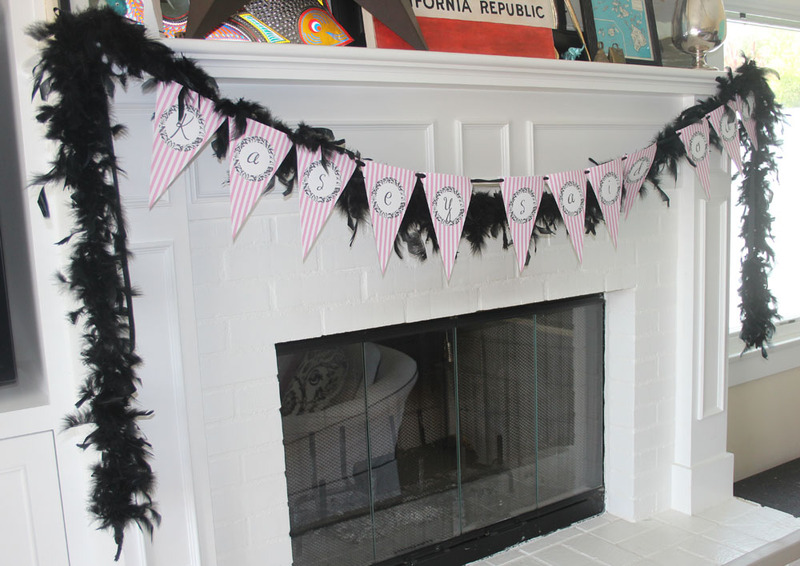 It’s especially hard to stop myself from overdoing it when the party is at my house… It’s so easy to tweak this or that or add ‘just a few more things’ when you’re living amongst the chaos. 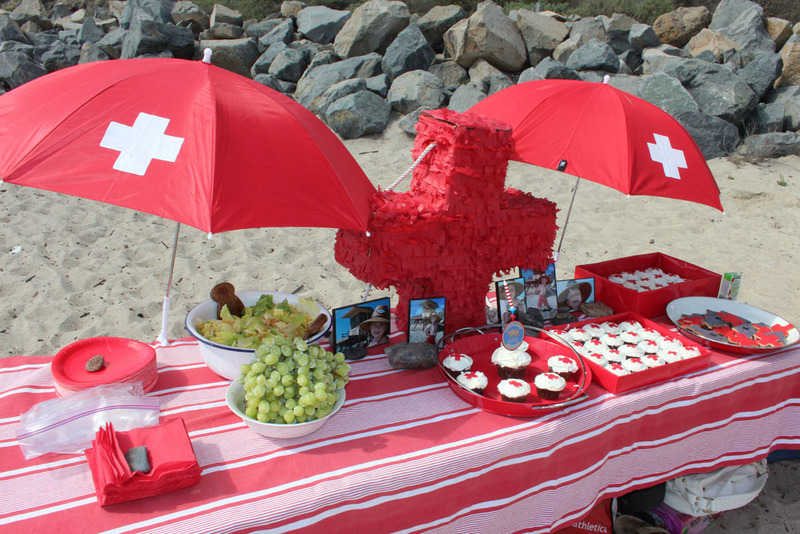 Because I am 8+ months pregnant, and because I am putting both this party together and hosting another one on Saturday, and mostly because my son so kindly wanted a lifeguard birthday party (and why would you have one of these at a house? 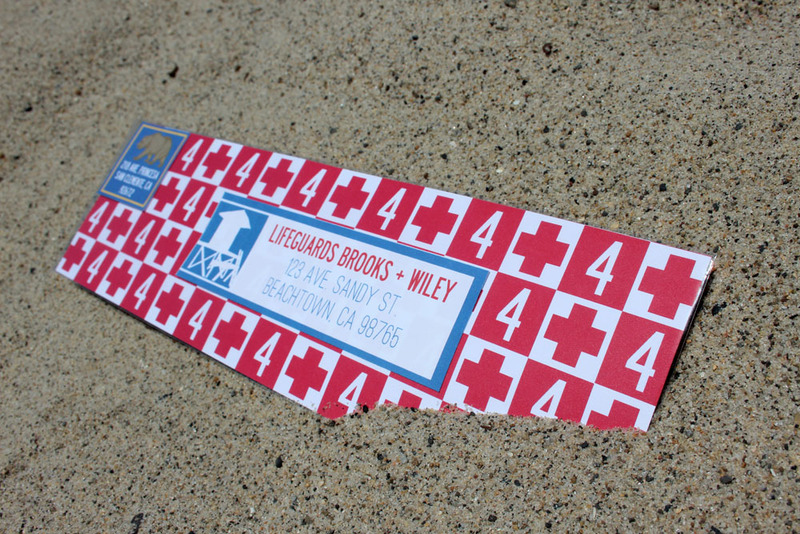 ), we are taking this bash to the beach! I have MADE myself keep things low key and easy and I think a mid-week party at an offsite location was just the right trick to keep my craziness at bay. 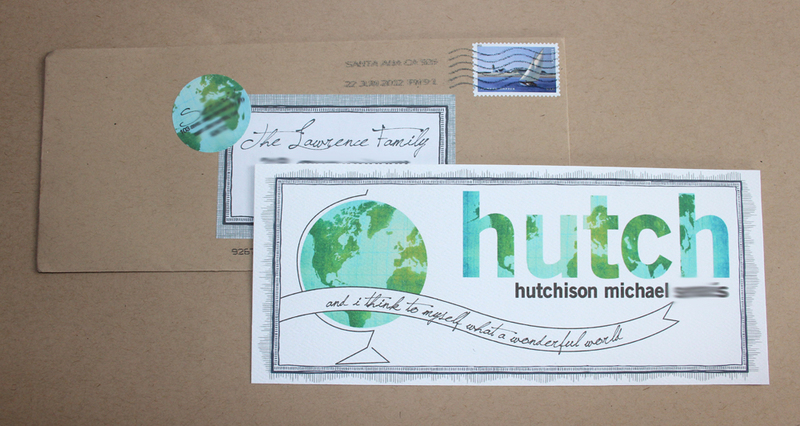 That being said, here’s a look at the invitation, which could be a little on the overboard side. But remember… I really do love this stuff. The invite is a funky shape – about 3.25″x11″ – (and actually all the invites got sent back to me because I didn’t put enough postage on them the first round! Ugh!) 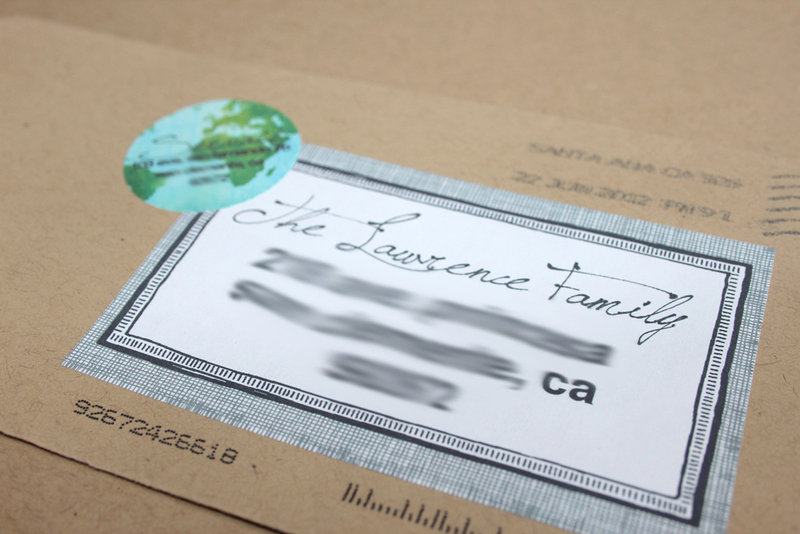 and I sent it in totally awesome clear envelopes from Clear Bags. 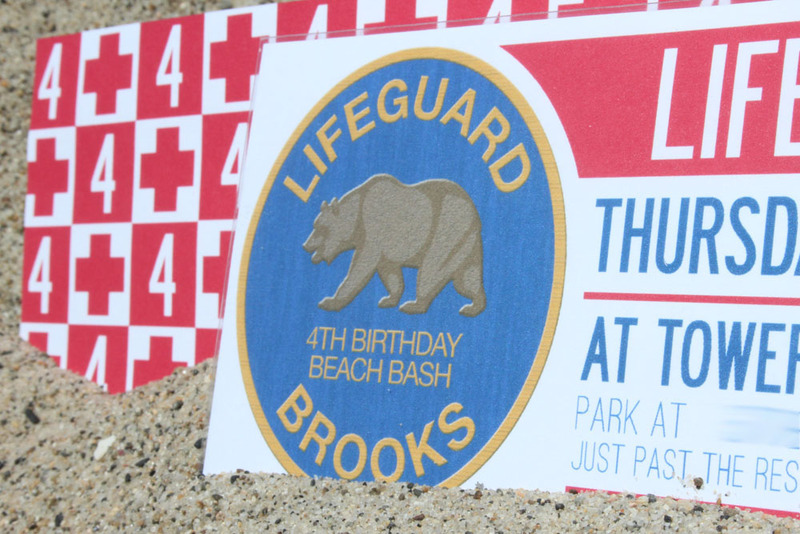 I printed a lifeguard cross & “4” design on the back of the actual invitation so that it would show through and put the address labels on the outside of the clear envelope. To disguise the birthday information, I place a ripped sheet of sandpaper over the front of the invite so you’d actually have a reason to open the envelope and see what it said. If I were in my psychotic prime, I would have lined the back of the sandpaper with a cute pattern but I left it as is…. ugly Lowe’s pattern and all. I actually think this is a mark of growth for me. Let it be! Move on! It is a party for a 4 year old not the Queen of England!! (Oh but I love this stuff! 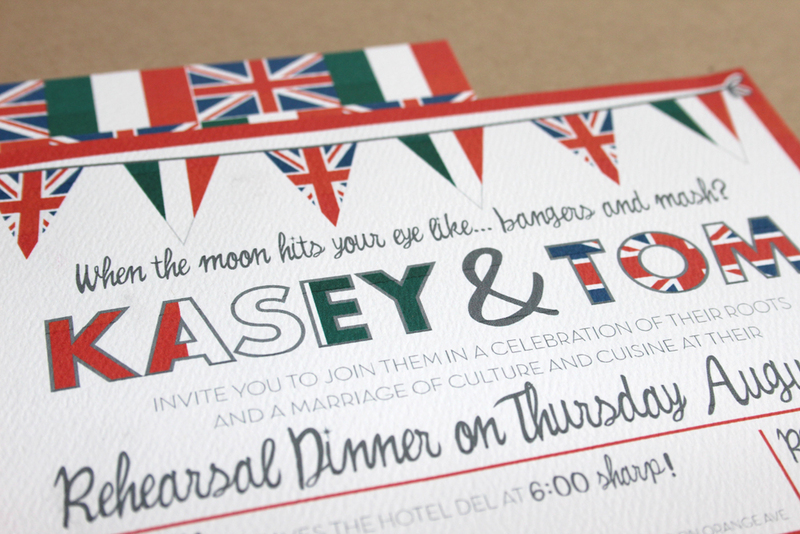 Such a teeter totter of emotions, invitation making is! Ha!) 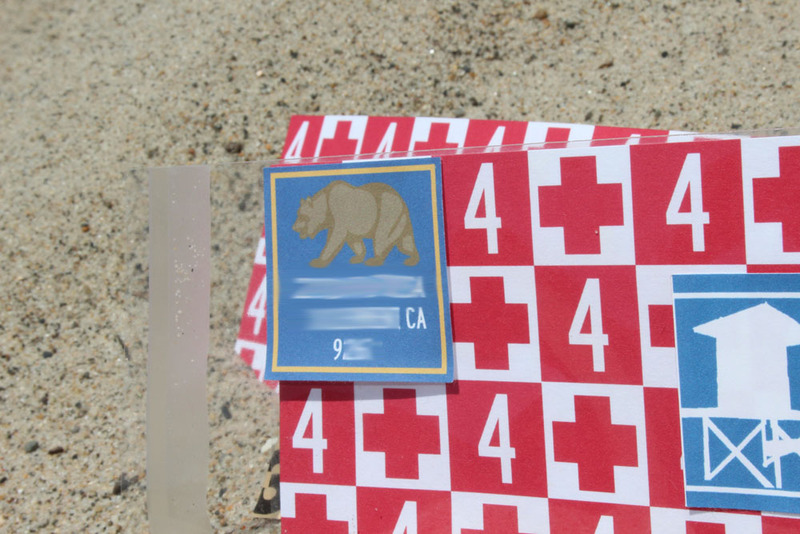 The state lifeguards in our area have bright red jackets with blue patches that have the California bear on them. I wanted to incorporate this into his invite to make it more legit. 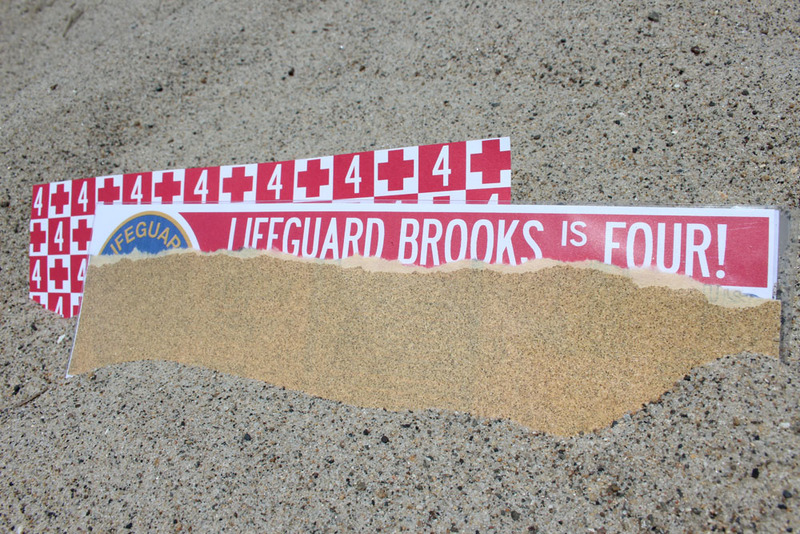 Our beaches also have a warning flag system for water safety and I wanted to mimic that idea as well. 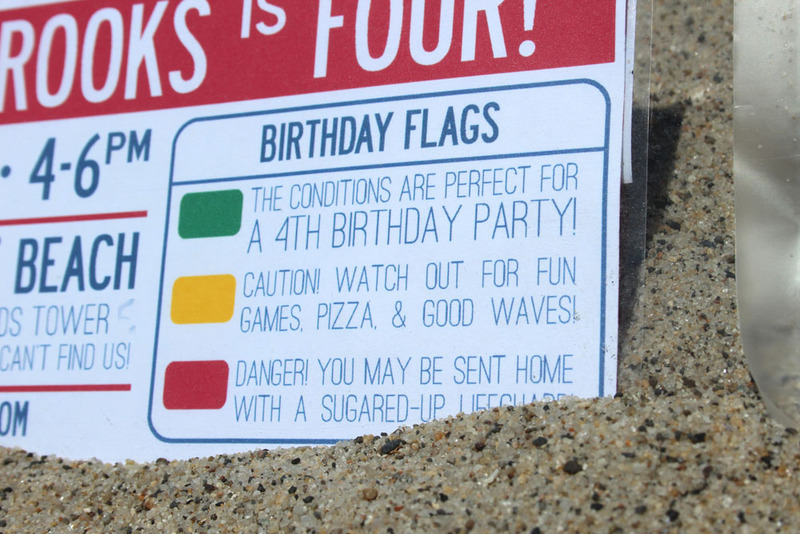 I could only come up with “Birthday Flags” but I am sure that there is a better idea out there. My brain has been 100% fried by my baby. 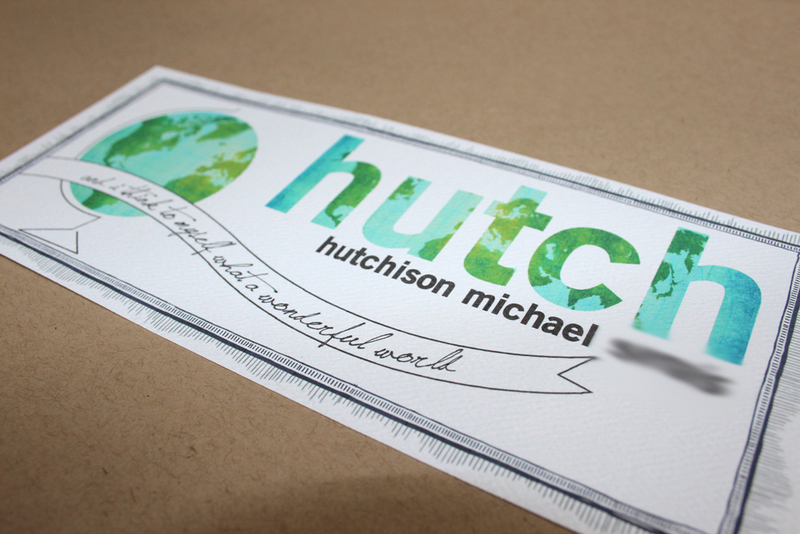 Here’s what the front of the invite looks like without the sandpaper. And that’s just about it! To keep with the low key idea, we just invited our families and Brooks’ close friends and classmates. It’s been a little tough but I guess I am realizing that kids probably don’t need 80+ people at their birthday parties! (BUT. IT’S. SO. FUN! See? Teeter totter! I have to admit I like myself a blowout!) More to come after the big bash on Thursday… Let’s see how mellow I can make this thing!